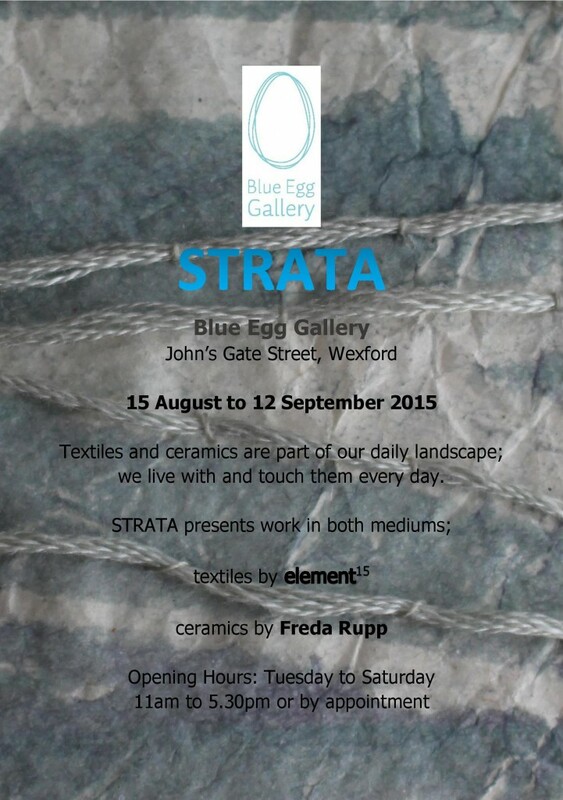 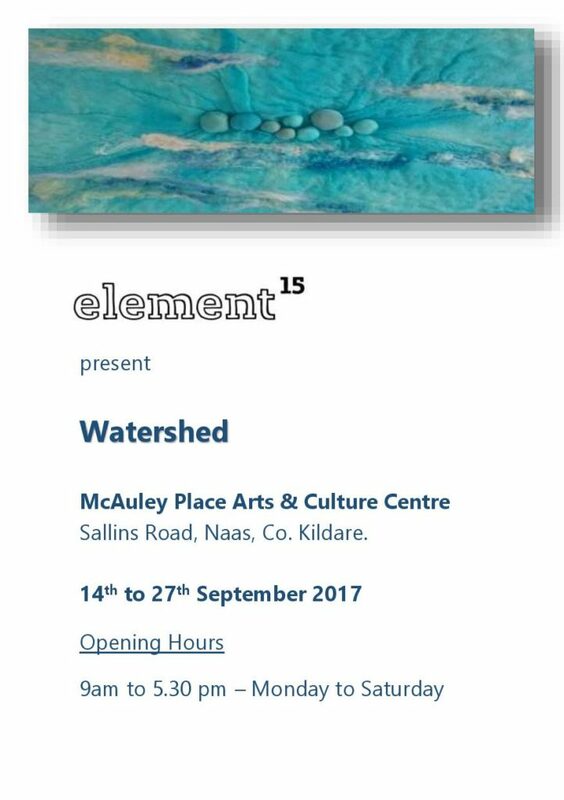 Showing until the mid October. 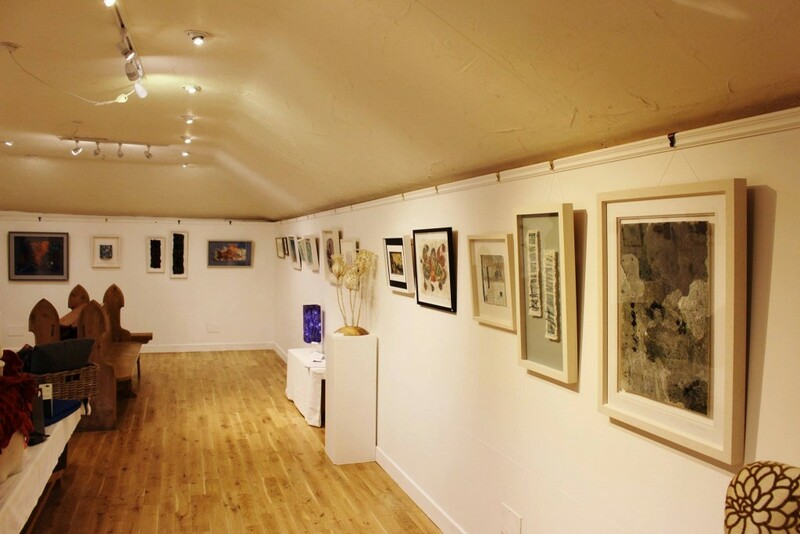 Open Mon-Fri, 9 am-5.30 pm and Sat: 9 am-4.30 pm. 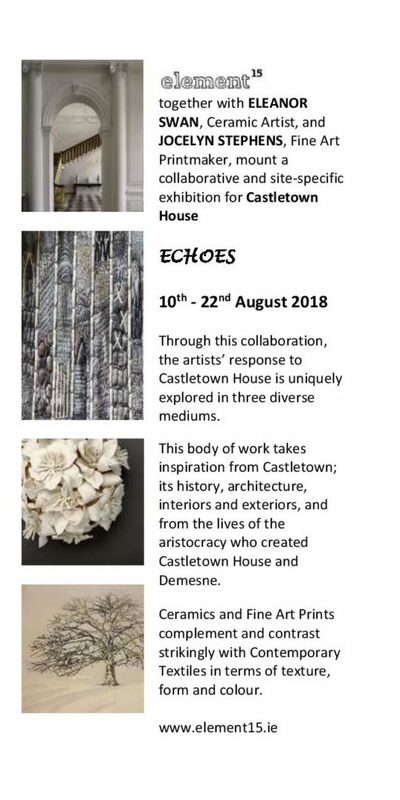 After one year of preparation, artistic struggle, studio days, planning meetings, peer review of our work, site visits, and house tours, we have opened a site specific exhibition in Castletown House, Co. Kildare. 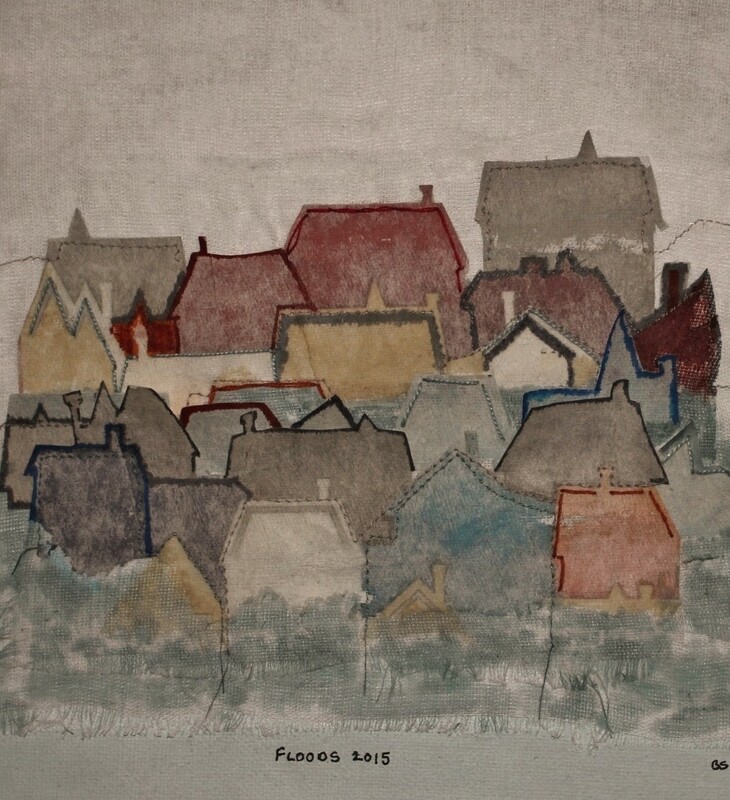 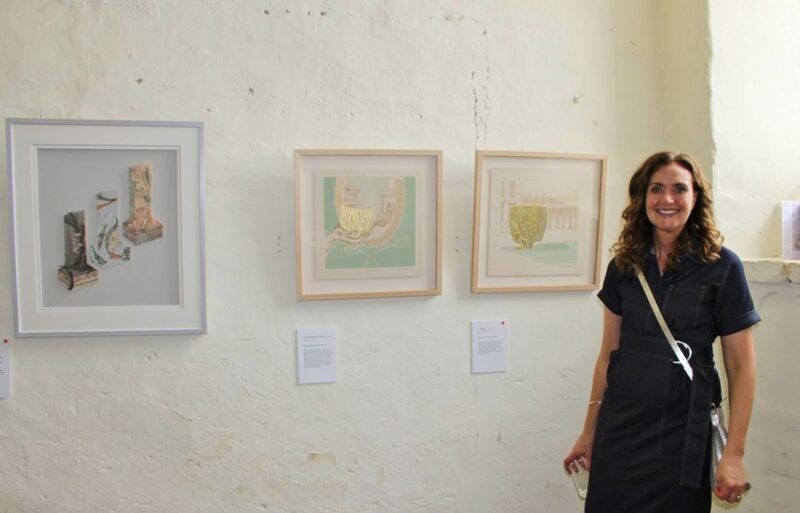 We collaborated with Eleanor Swan, Ceramic Artist and Jocelyn Stephens, Fine Art Printmaker to produce an eclectic body of work in response to the architecture, history and interiors of the building and the lives of those who have lived there. 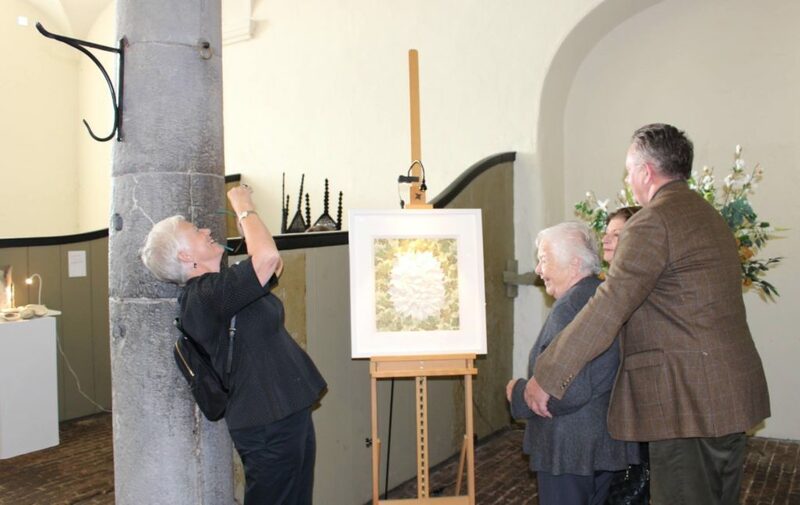 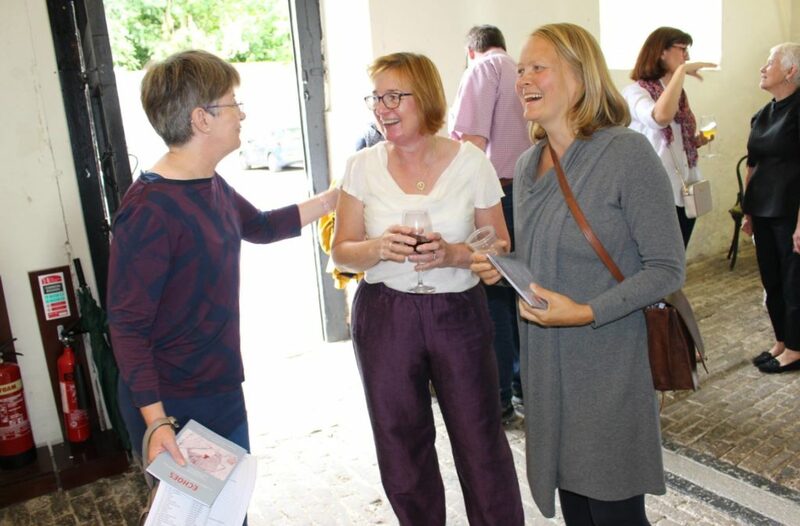 We had a very successful and enjoyable opening event (see photos below) in the wonderful venue of the Stable Courtyard. 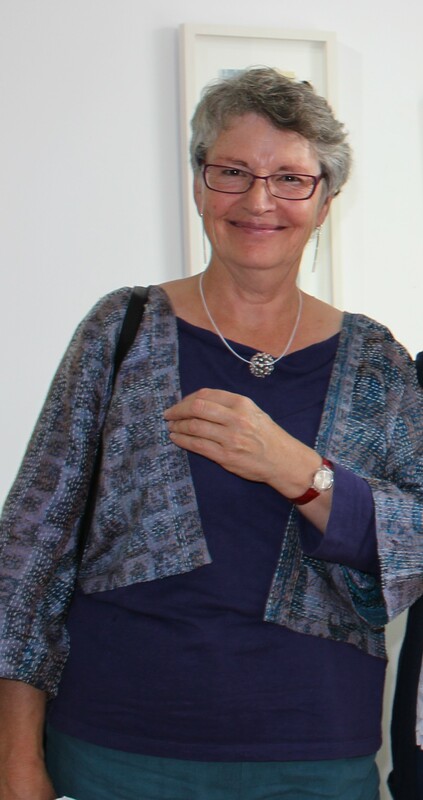 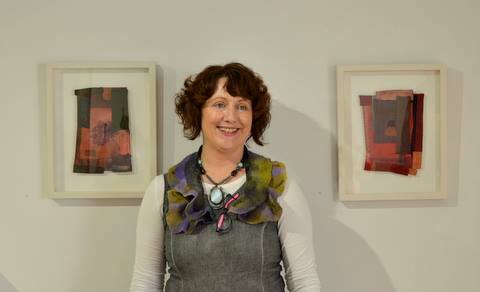 Special thanks to Anne-Marie Keaveney, NCAD for an inspiring opening speech and to all our friends and supporters for the encouragement. 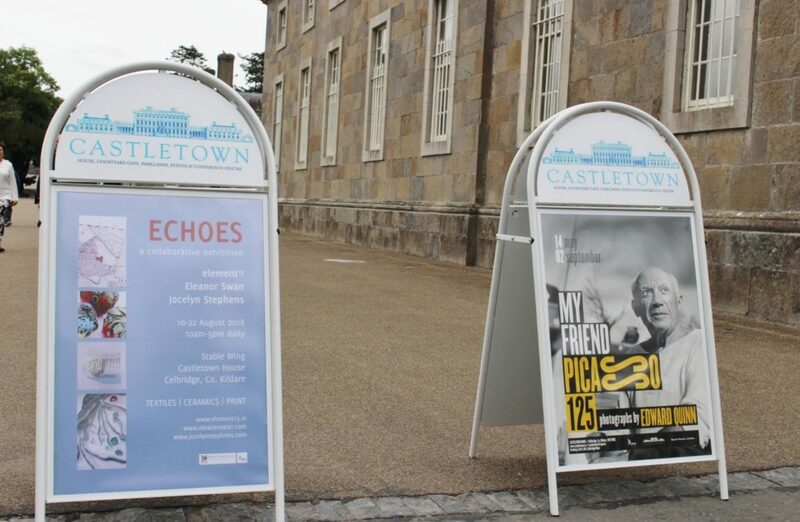 In good company at Castletown! Some photographs from the evening! 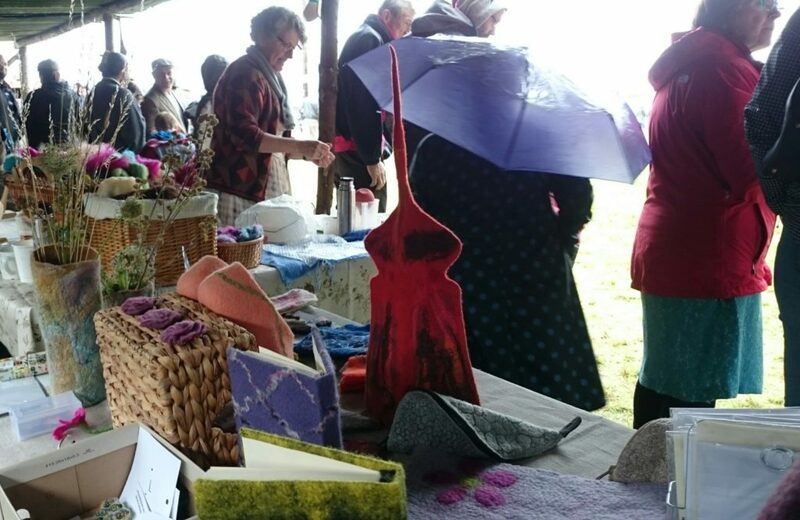 element15 were invited to demonstrate wool fibre felting at the Hollywood Vintage Fair again this year. 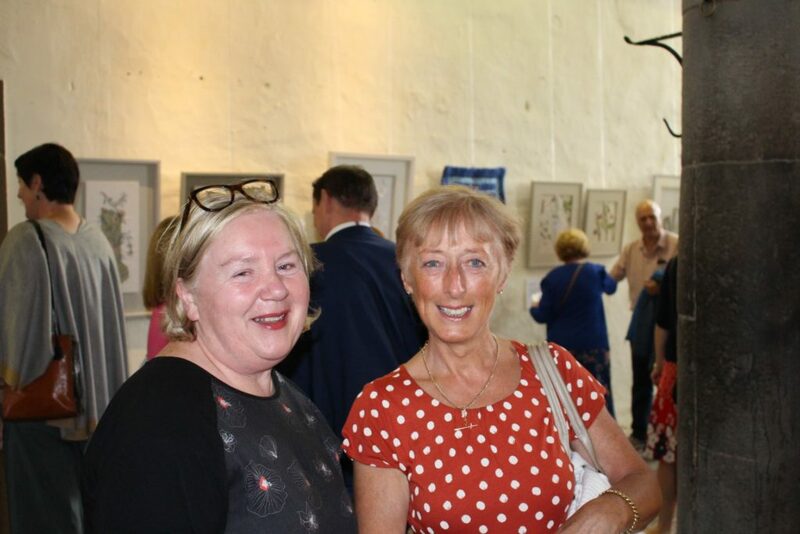 Hollywood is just outside Blessington along the Wicklow Gap route and is a lovely little village which is transformed into pre-1950’s Ireland every August. 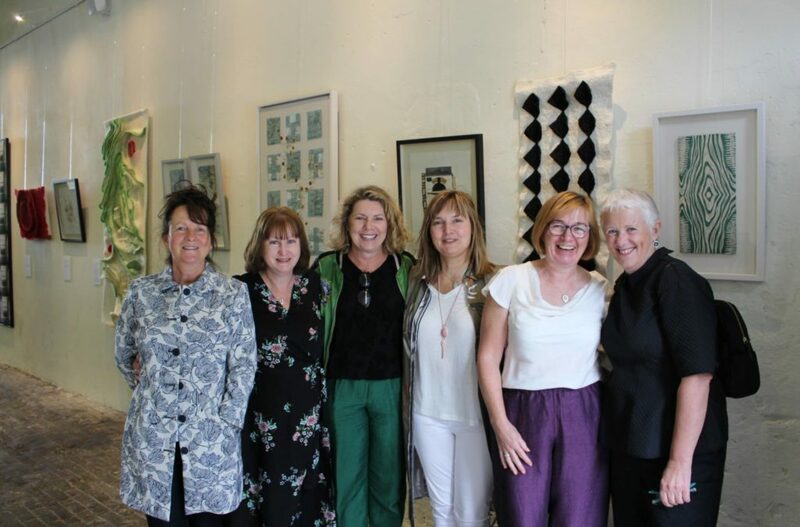 A lot of credit is due to the people of Hollywood for all the hard work they put into the Fair. 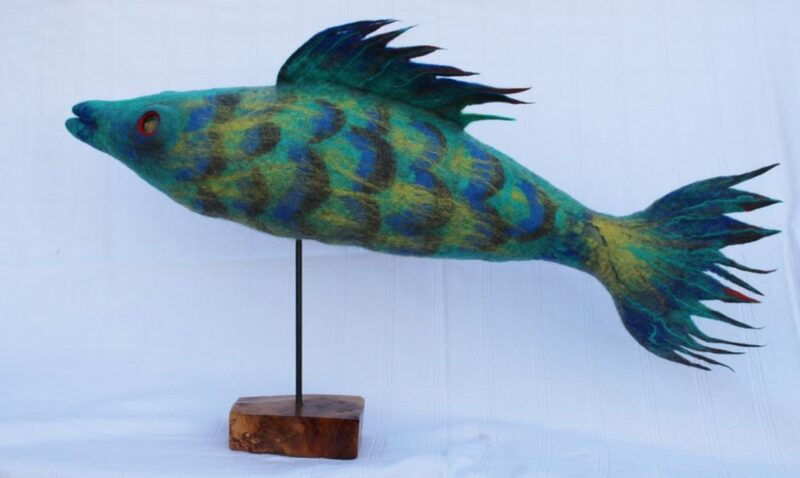 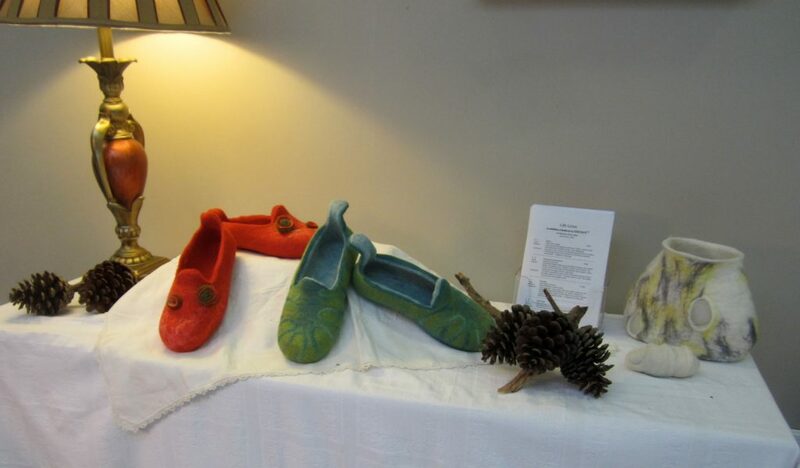 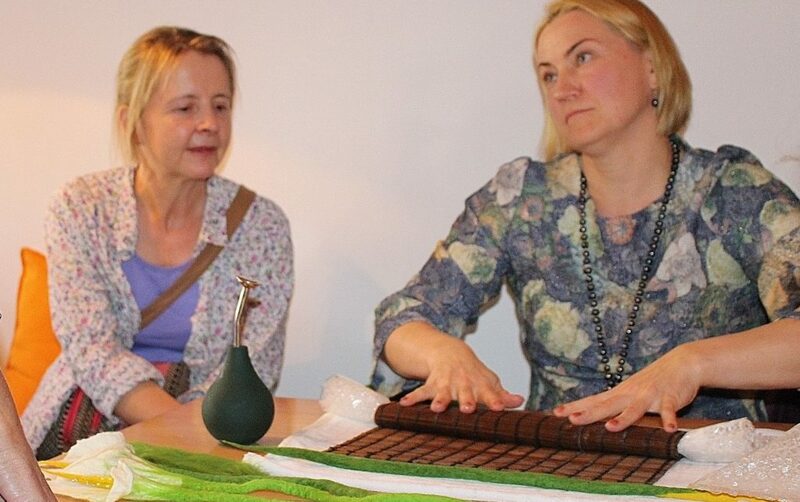 There are various old hand crafts demonstrations – spinning, wood turning, basketry, and felting. 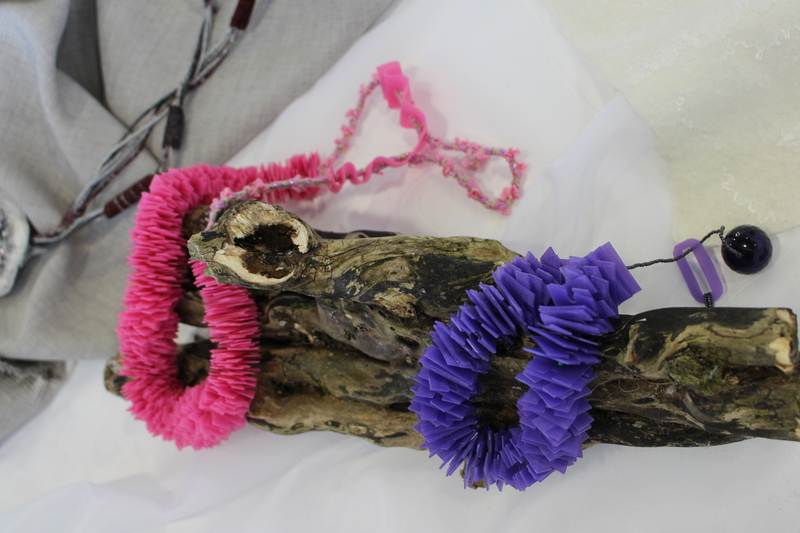 A lot of the stall holders and visitors dress up in vintage clothing. 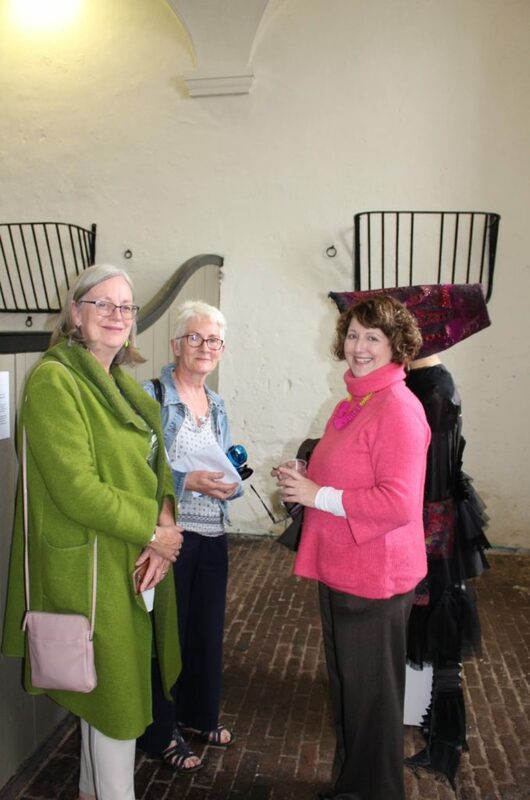 The children and adults love dressing up and getting into the spirit of the fair as you can see from our attire! 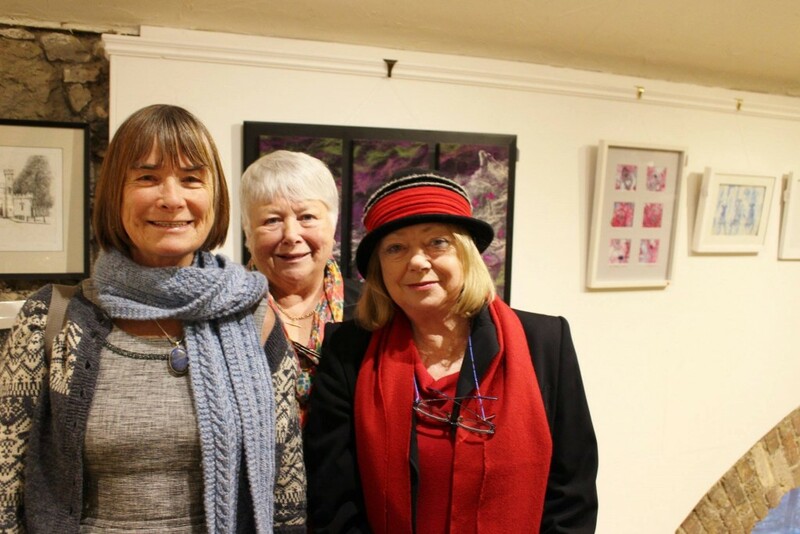 There was such an array of collarless shirts, braces and flat caps worn by all ages. 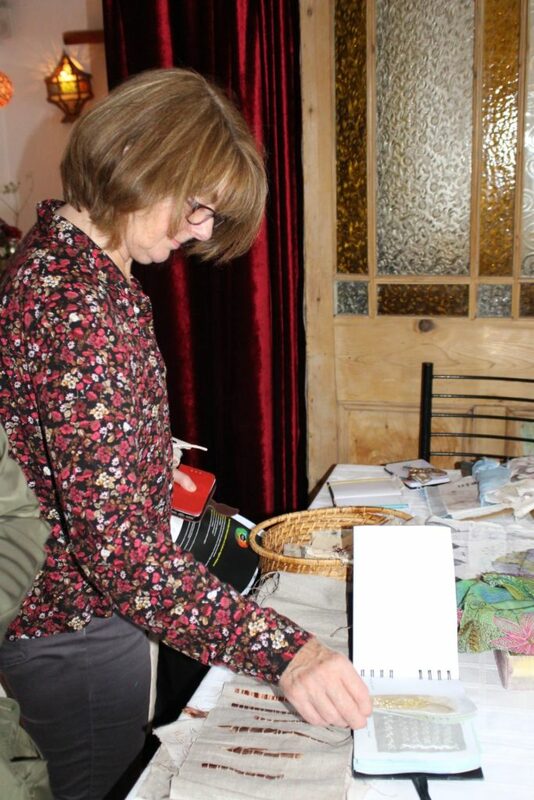 Colleen and Kathrina set up the stall early in the morning and Dee came along to help out later. 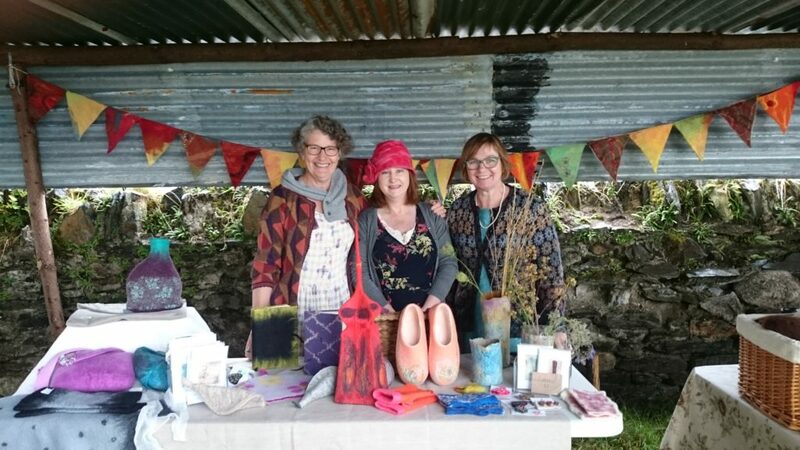 There was a lovely display of felted items and the element15 bunting looked fabulous against the stone wall and corrugated tin roof. 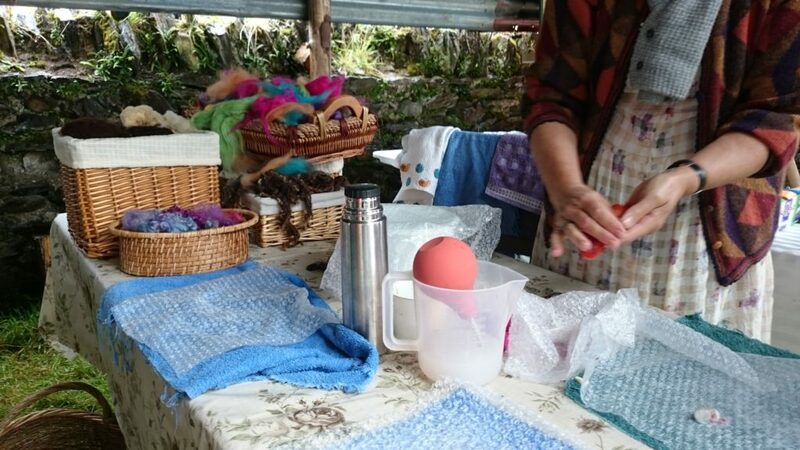 They worked flat out felting flowers and snakes with the children; some of the adults were a little too shy to get involved but enjoyed looking on and asking questions. 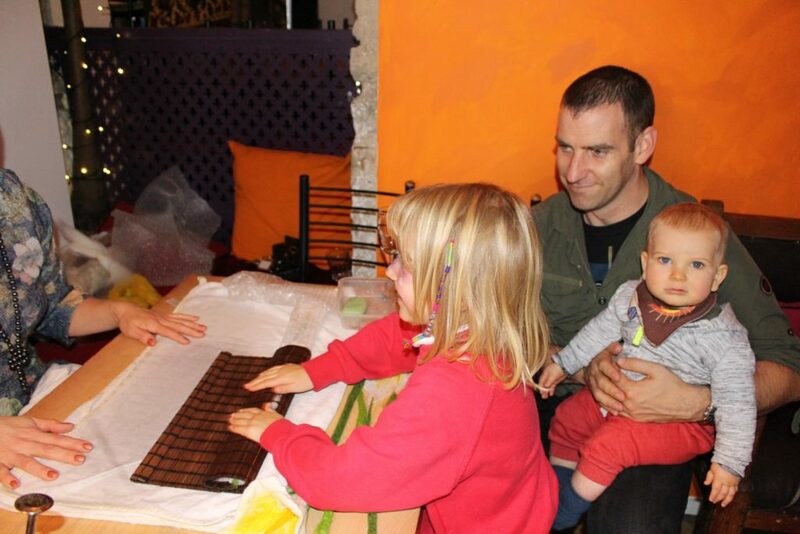 Unfortunately it rained all day but this did not take away from the fun of the fair. This is our first collaboration on a live event with the restaurant Two Cooks. 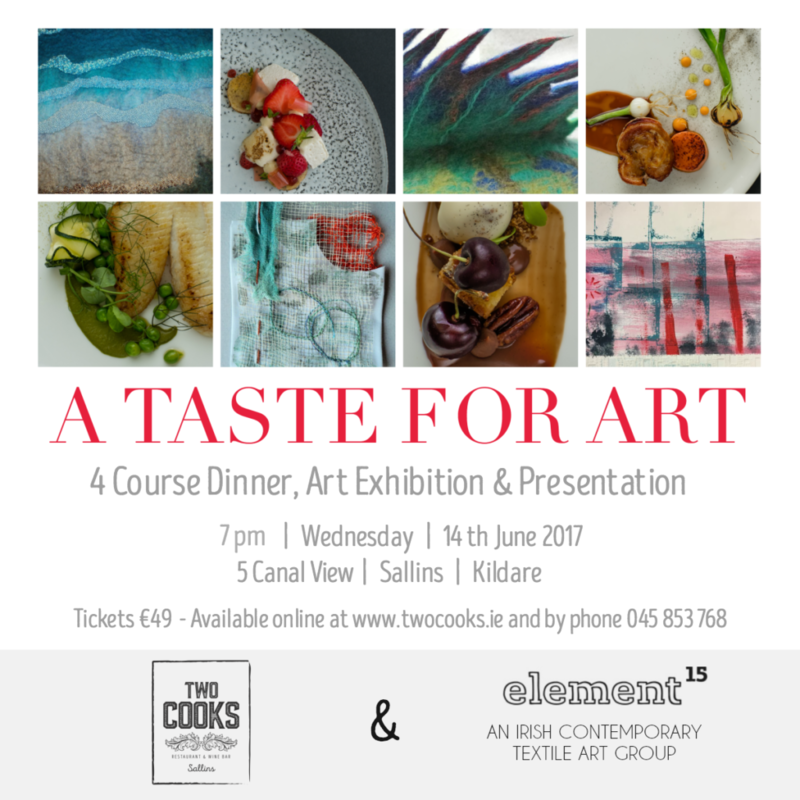 An evening of fine food and art. 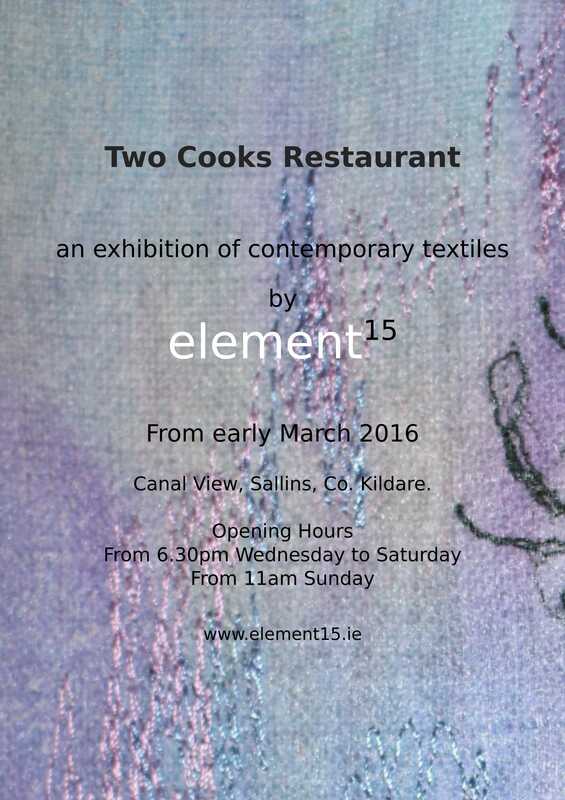 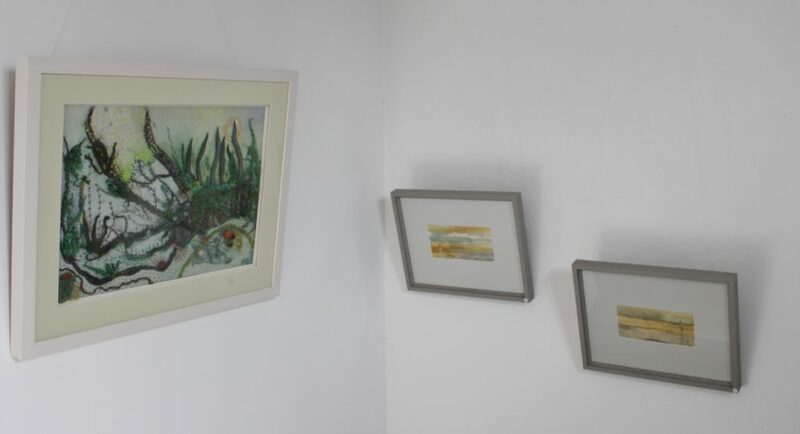 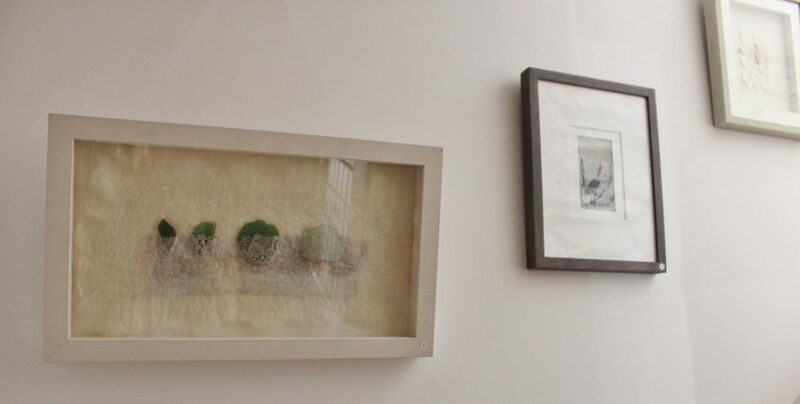 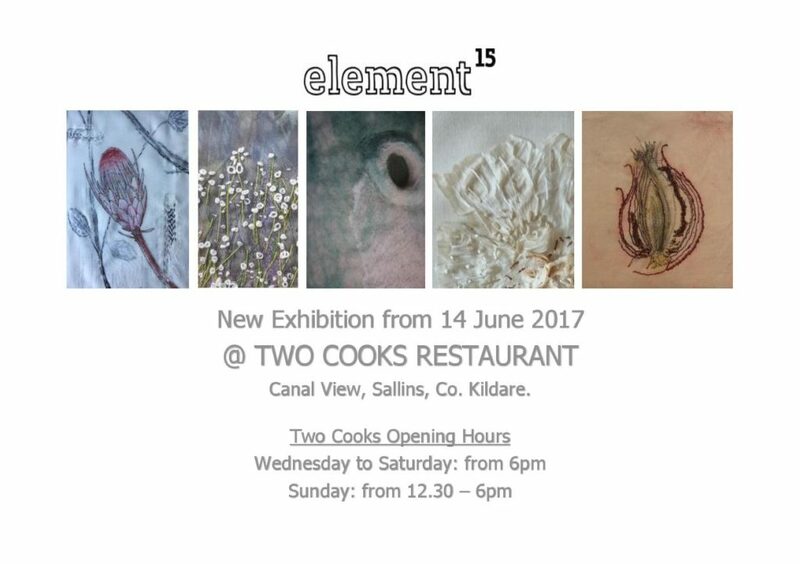 The night will consist of a 4 course dinner, a presentation by our group with insights into the artistic process and all in the lovely setting of Two Cooks where you will be able to see our current exhibition and chat to the artists between courses! 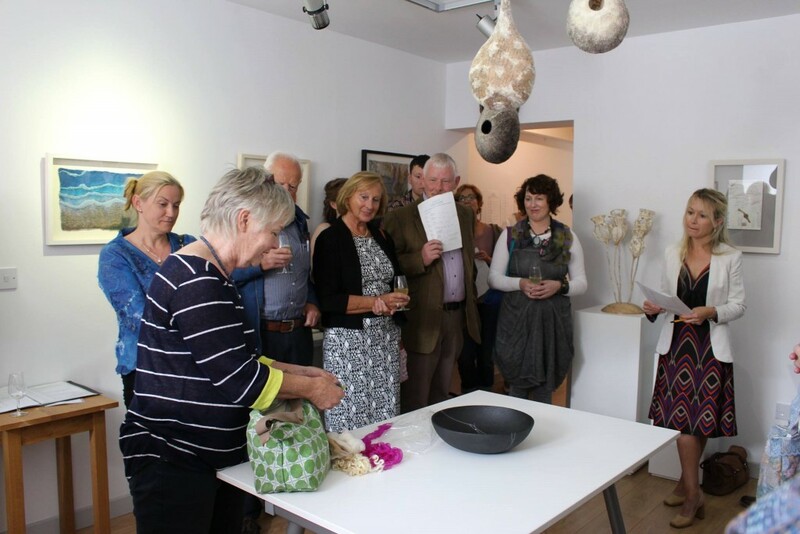 You can book the event through the Two Cooks website link here – when you select the 14th June and click next our event comes up. 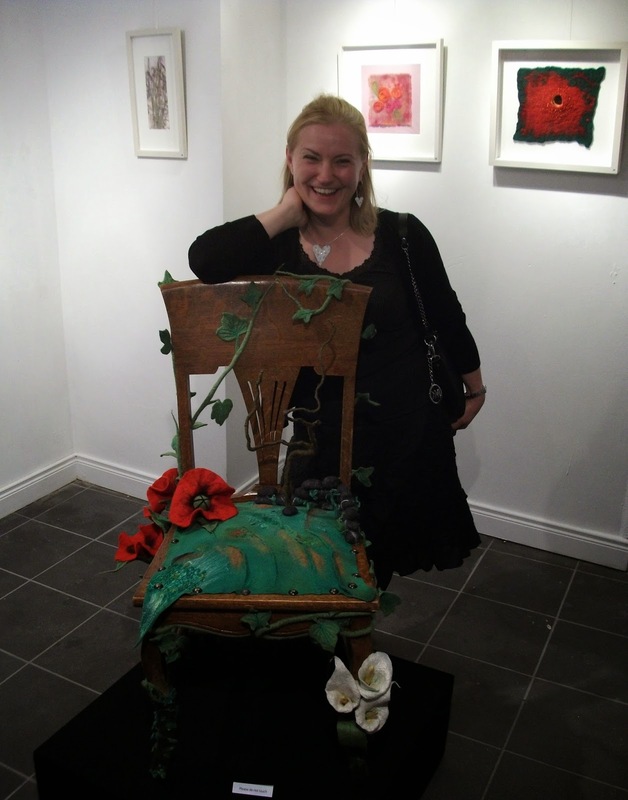 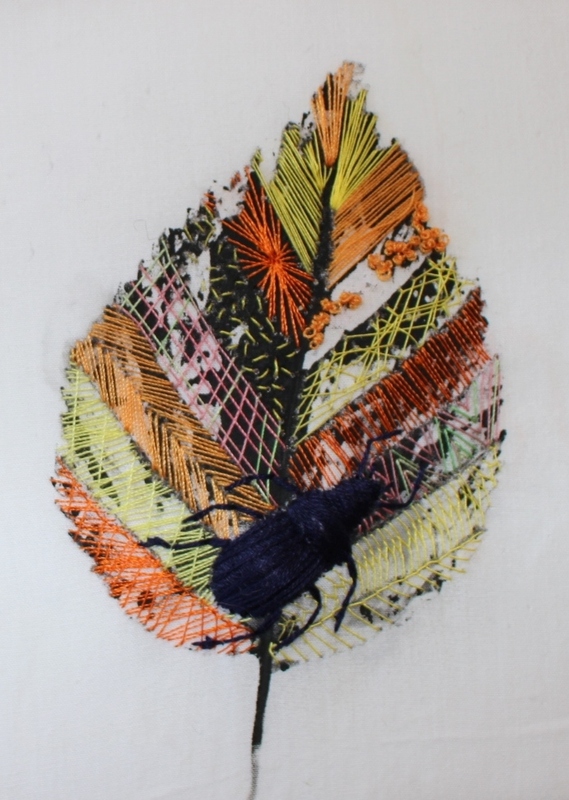 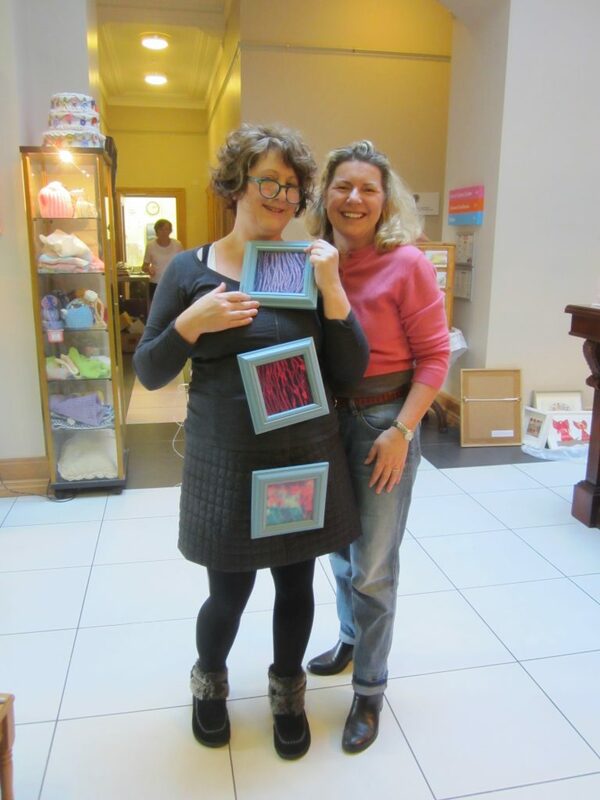 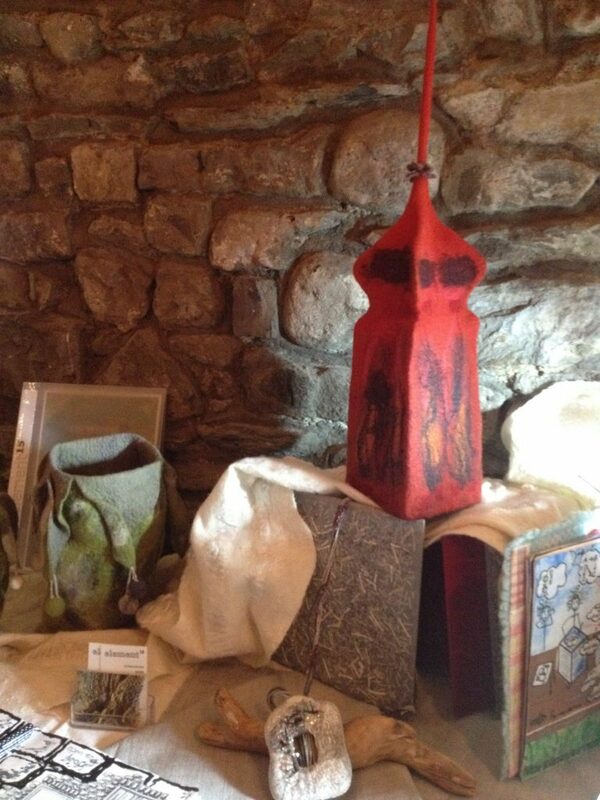 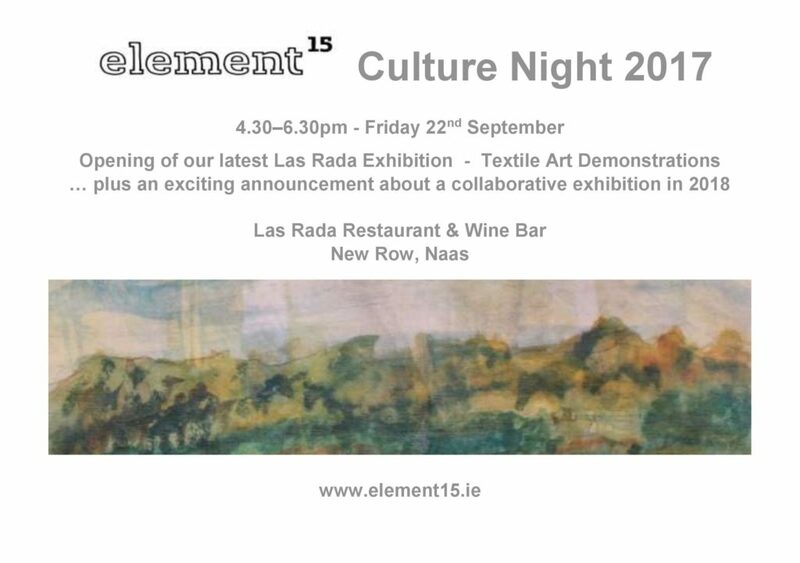 Our textile art demonstration for Culture Night was a great success. 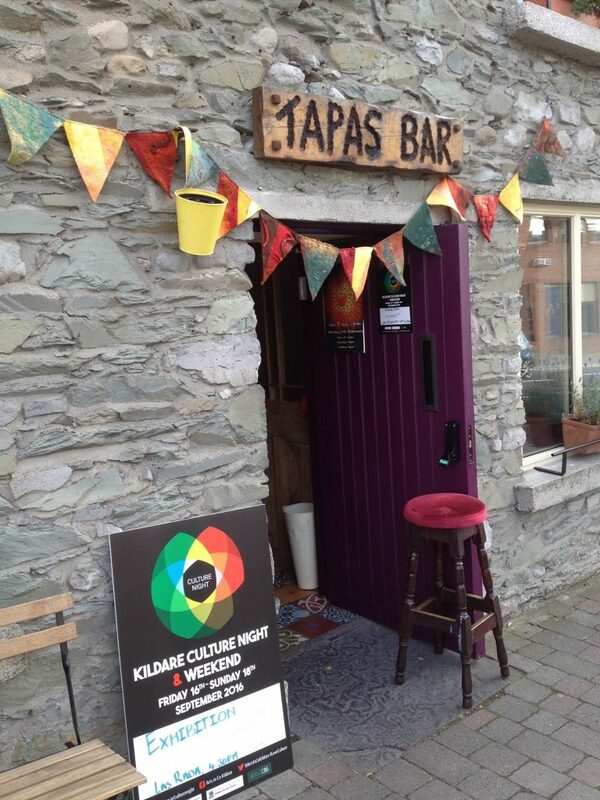 Our hand felted and hand stitched bunting added a bit of festivity to the beautifully coloured entrance to Las Rada! 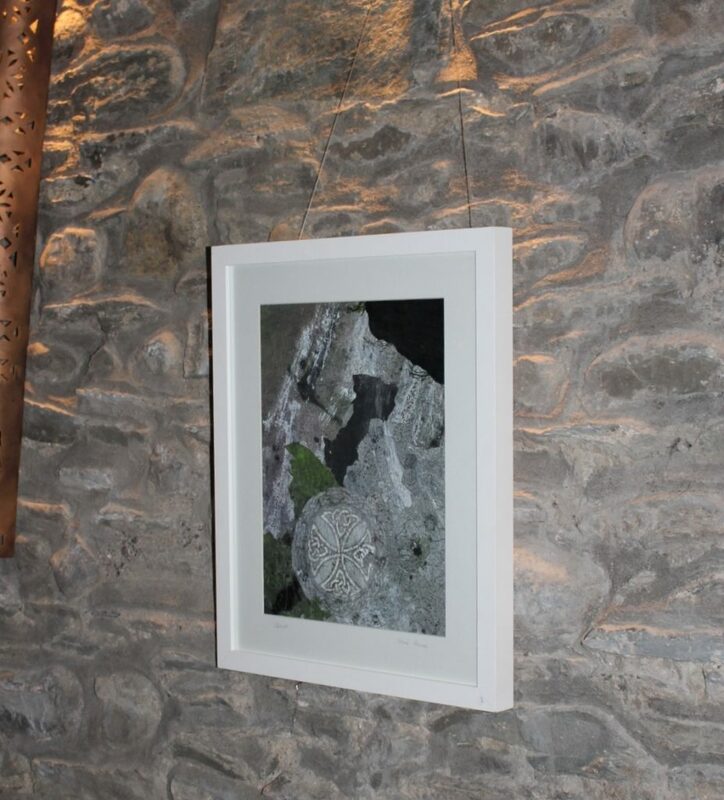 We had some of our 3D work on display for the occasion as it cannot normally be exhibited in Las Rada. 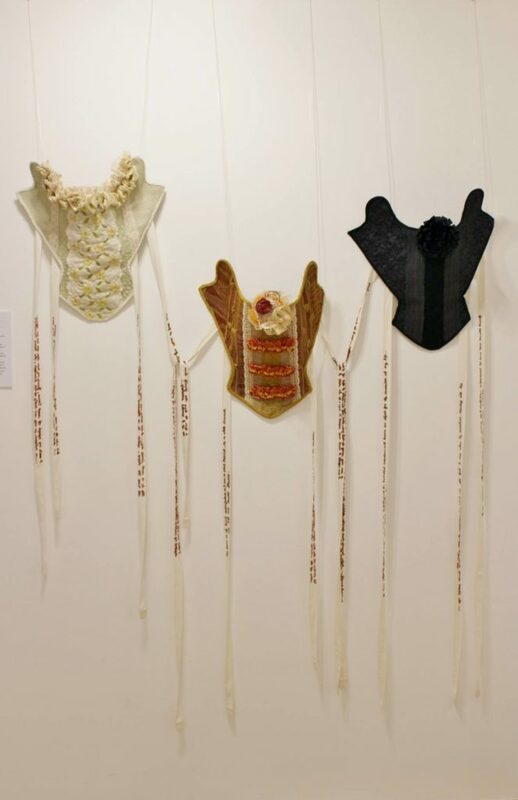 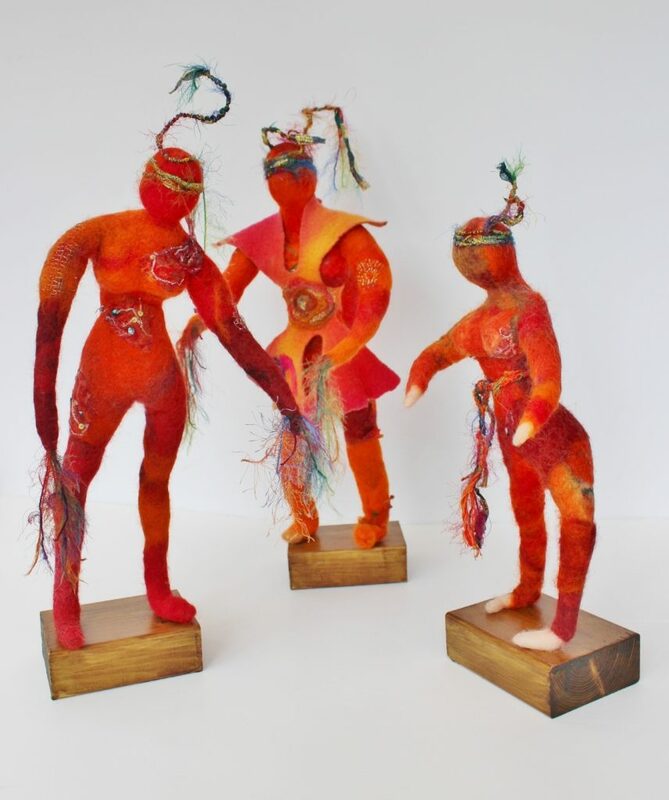 These are Marie Dunne’s ‘Amazonian Warriors’ – pretty amazing! 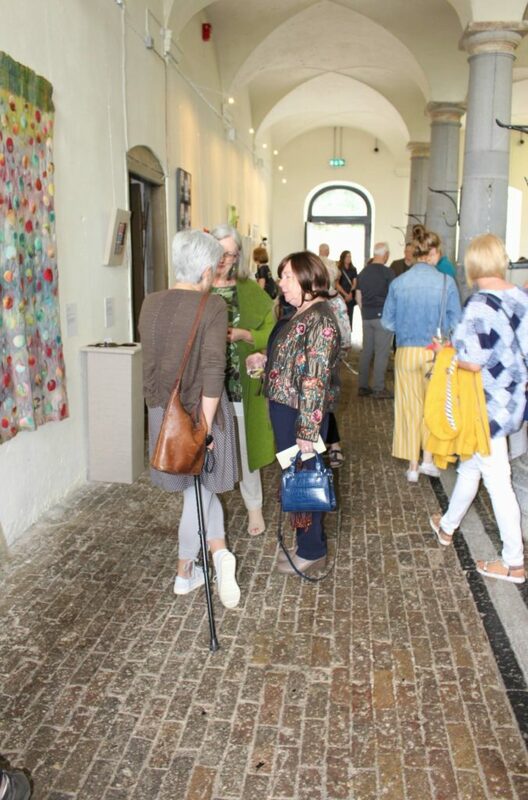 Opening Hours: Mon – Fri: 9 a.m. – 5.30 p.m. 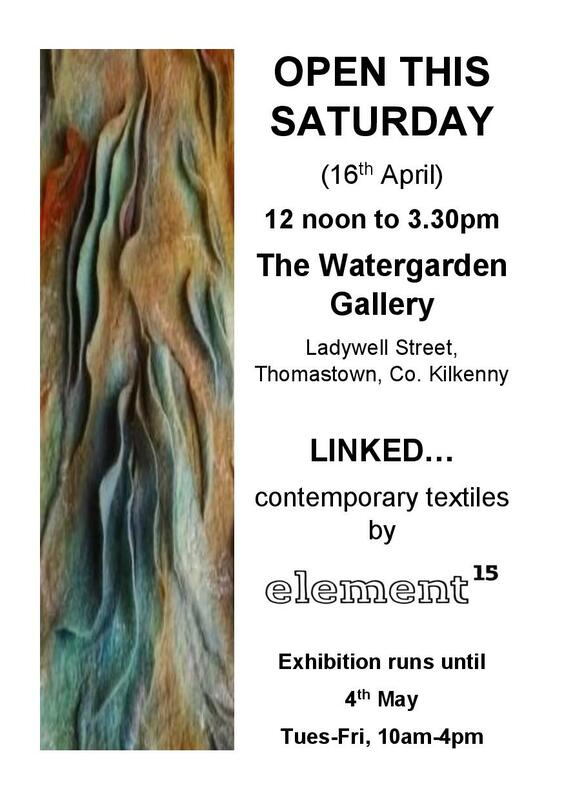 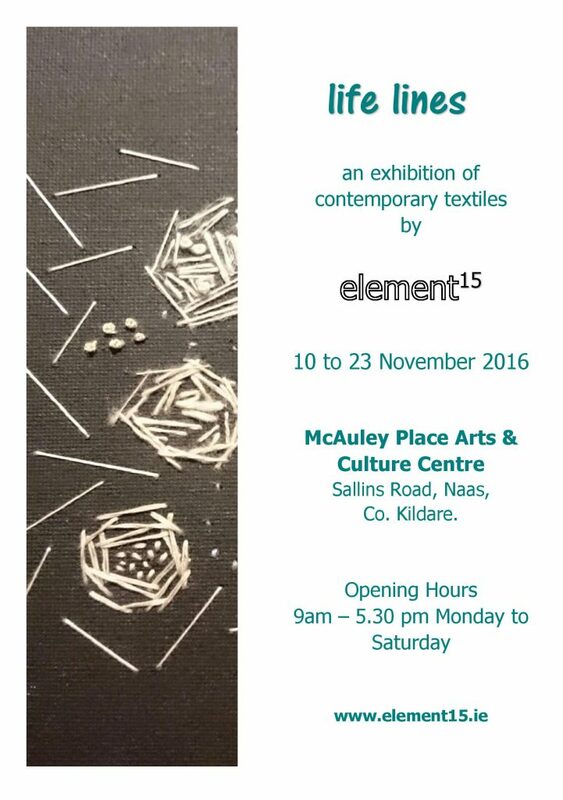 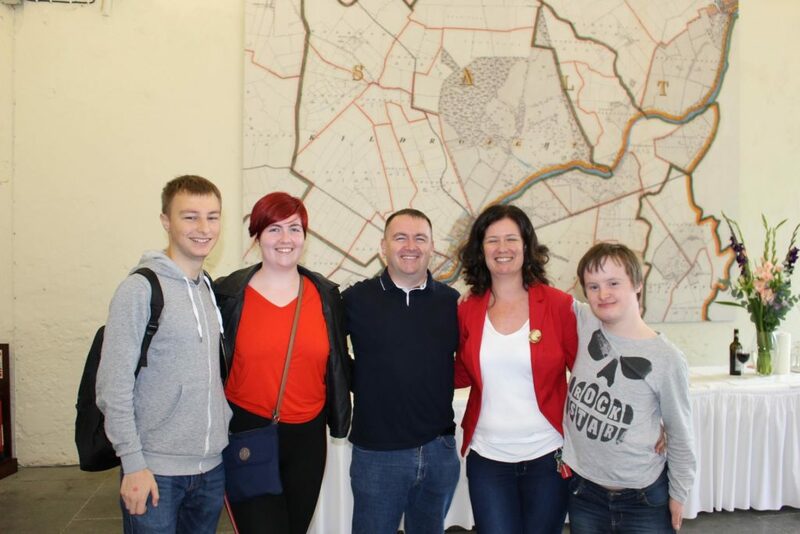 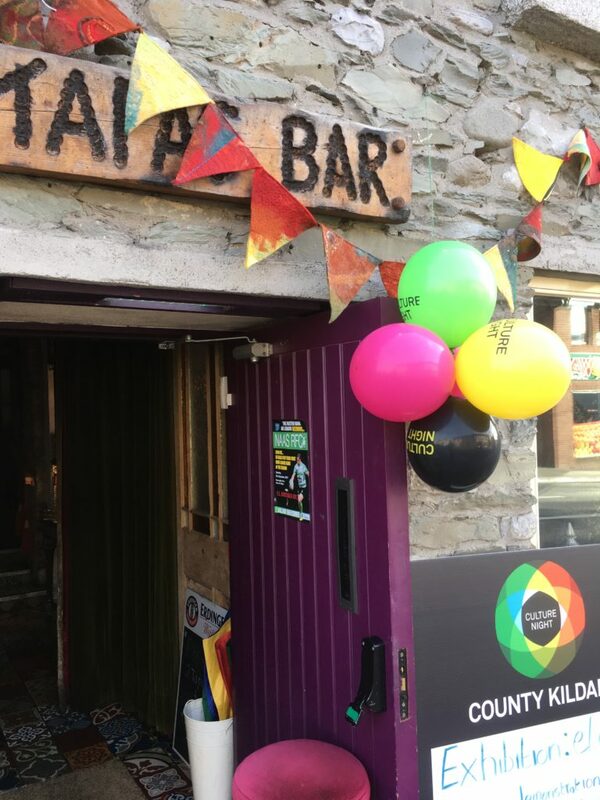 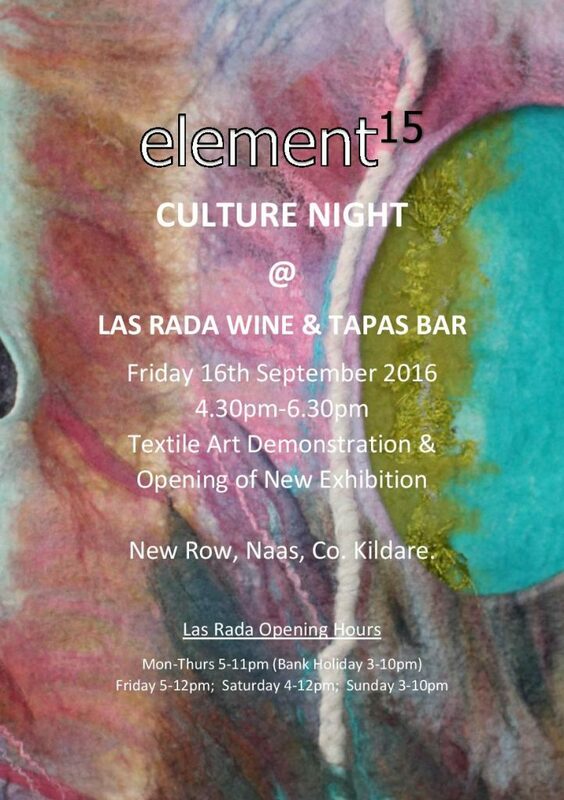 Sat: 9 a.m. – 4.00 p.m.
to coincide with Culture Night Kildare (Friday, 18th September). 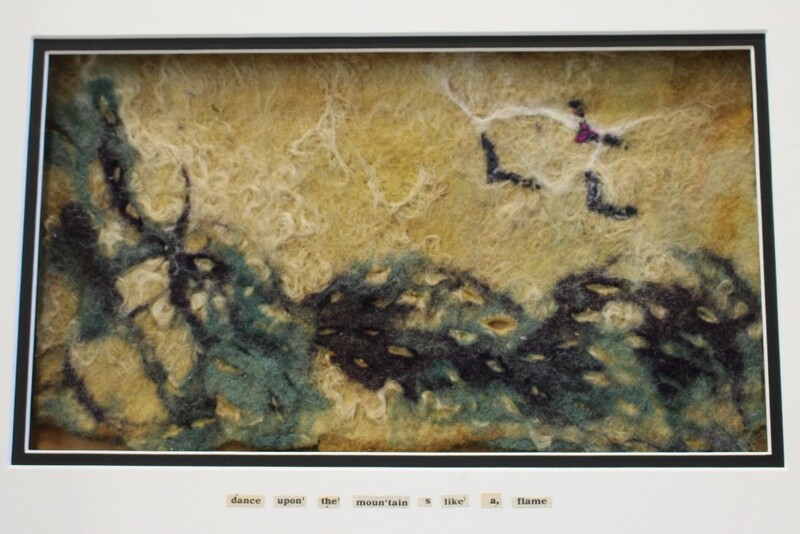 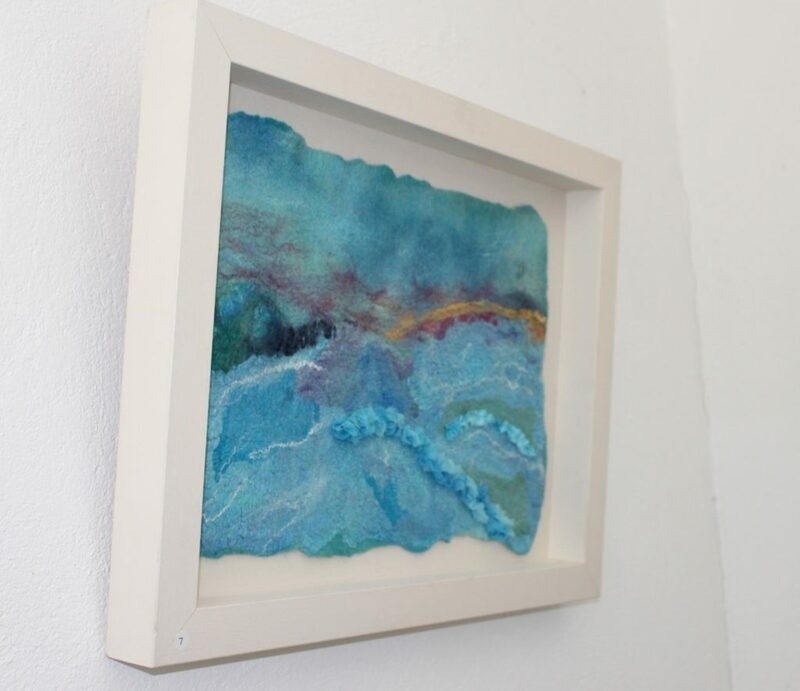 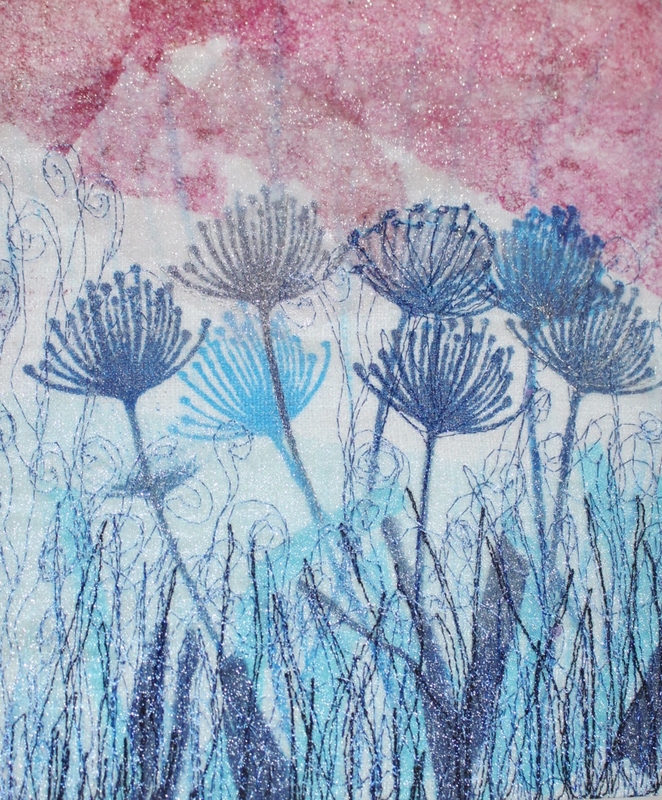 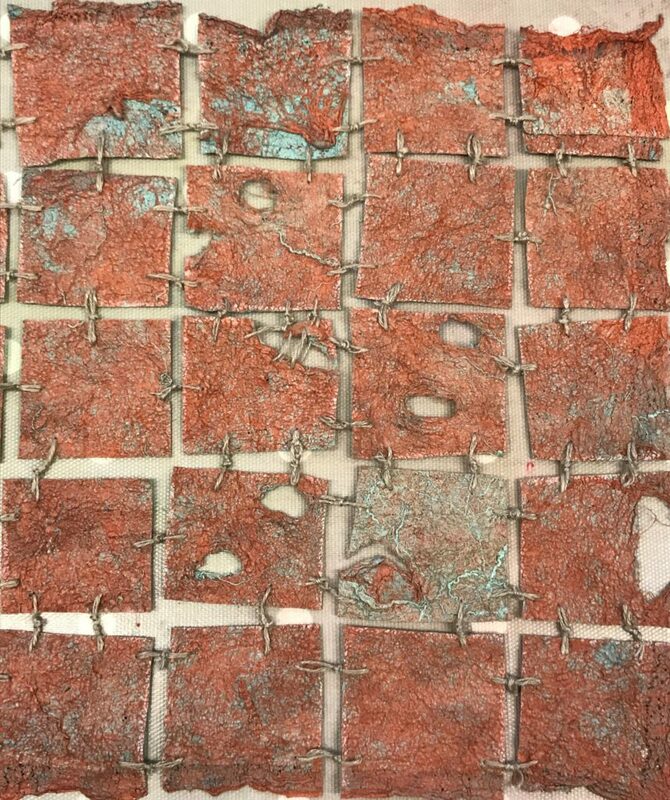 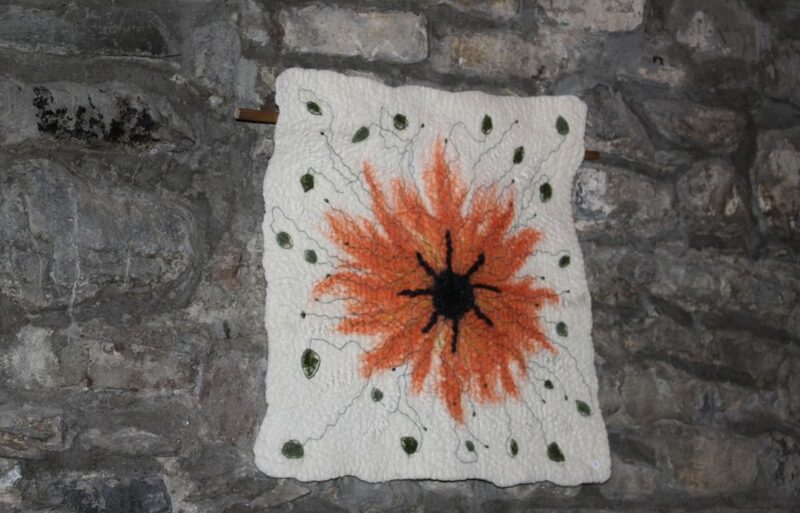 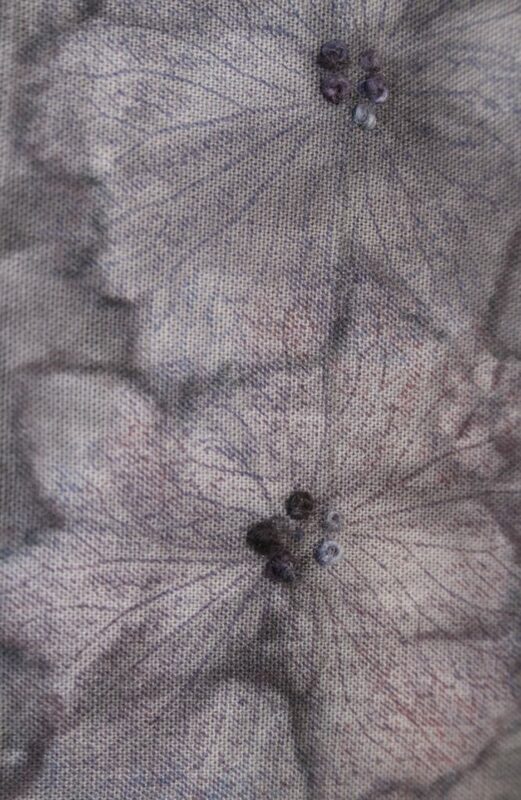 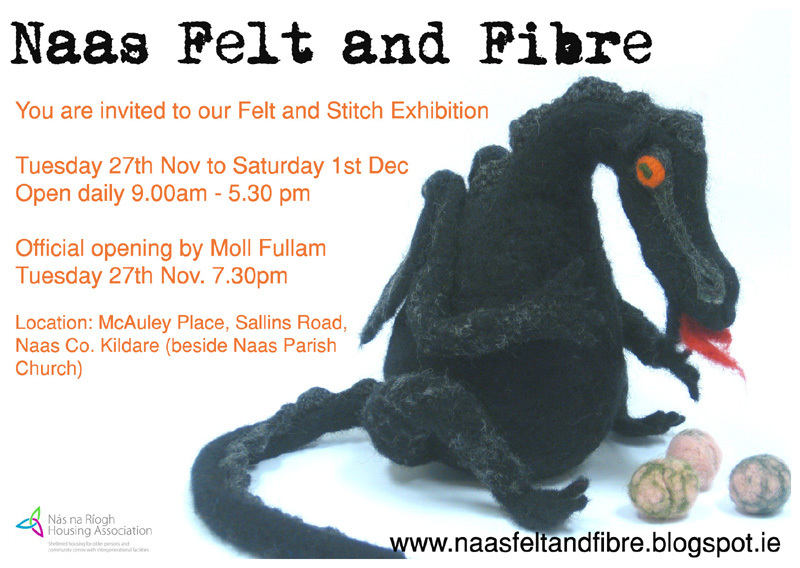 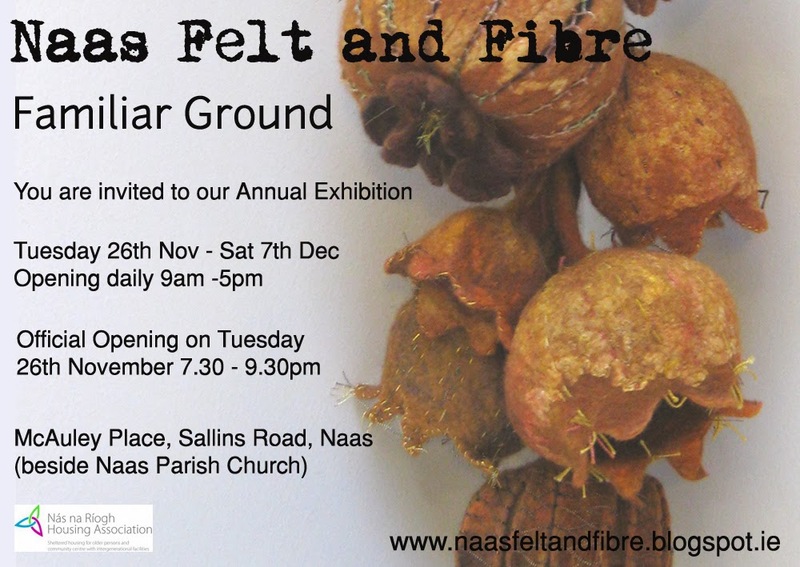 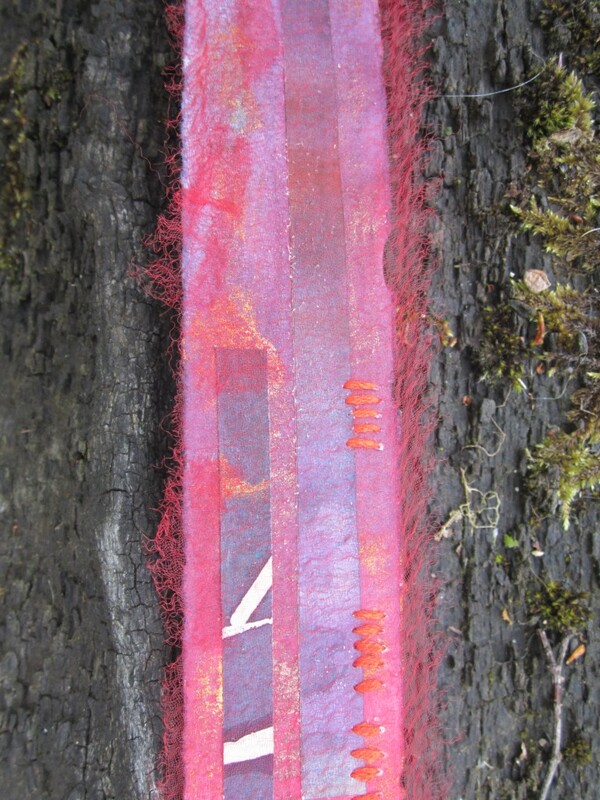 Wet felted Merino wool and silk fibres, machine and hand stitched. 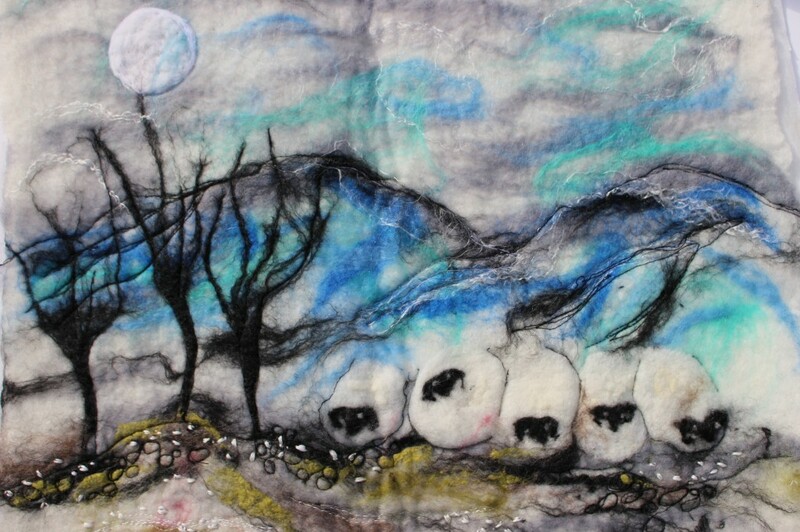 Inspired by watching a flock of sheep bedding down for the night. 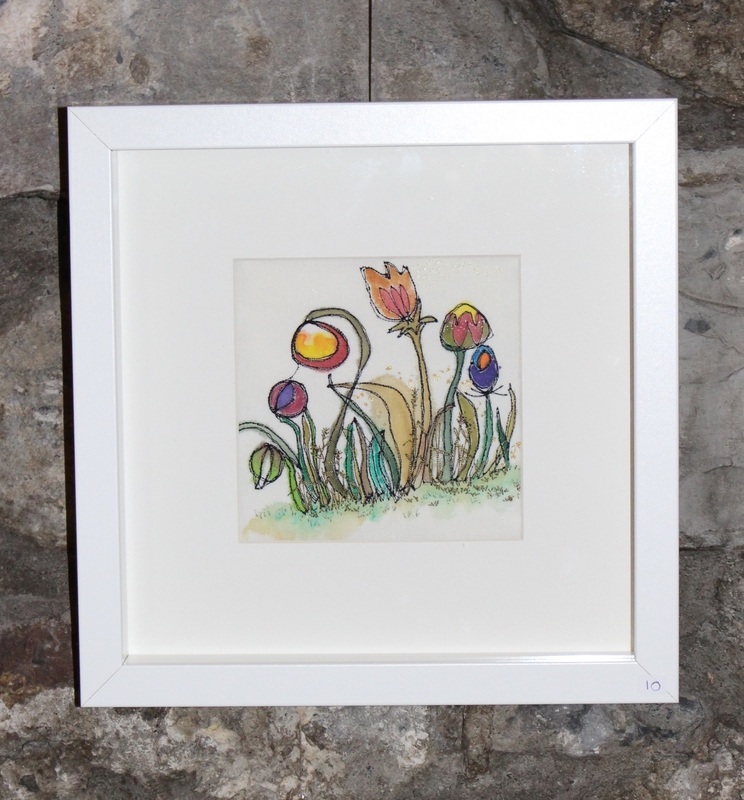 ‘Summer Splash’ by Eimear Molony – a bouquet of flowers evoking memories of vivid summertime colours. 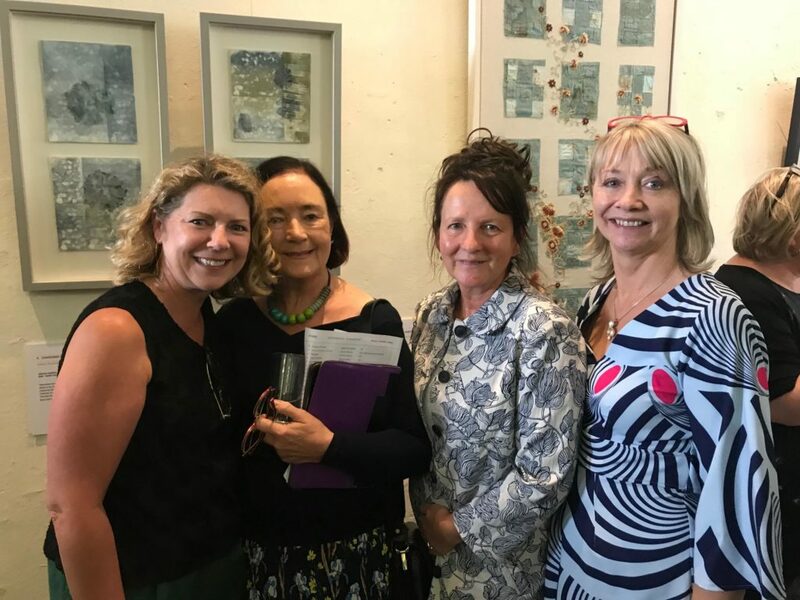 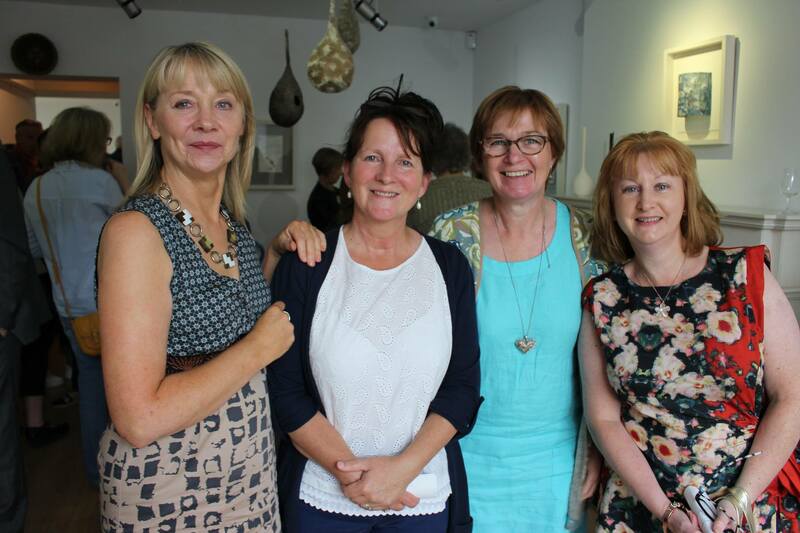 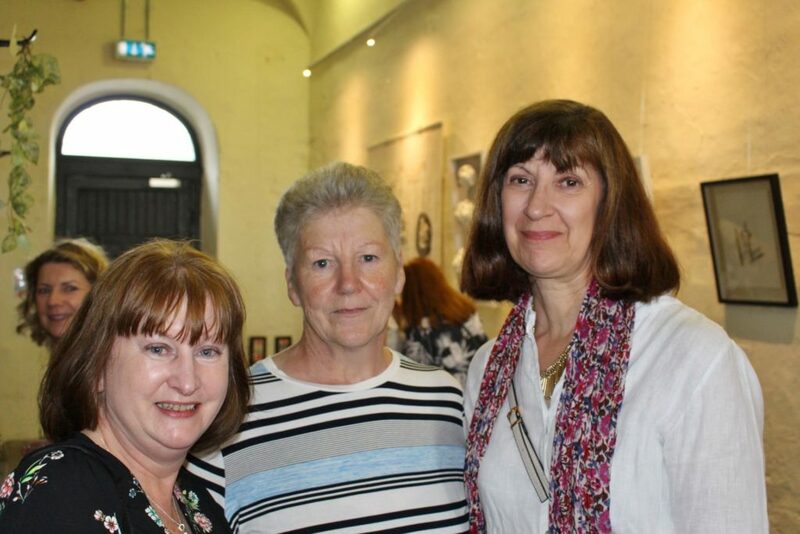 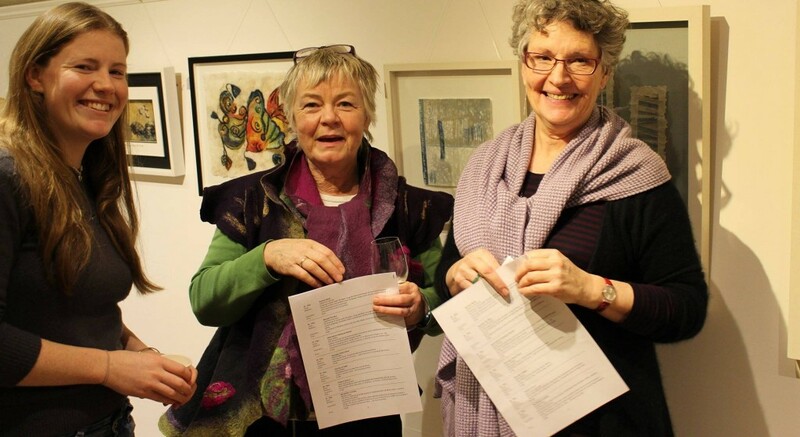 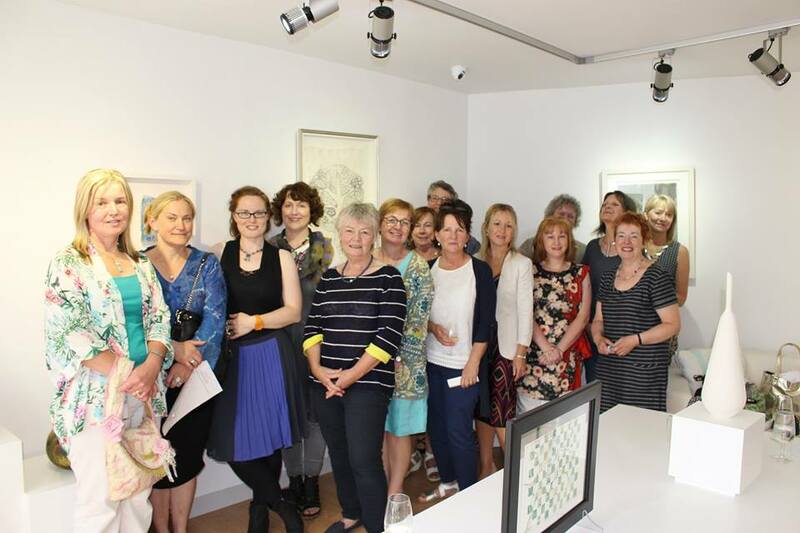 Thirteen of our fifteen members are joined in this photo by Mary Gallagher, owner of the gallery, Freda Rupp Ceramicist and Rina Whyte who was our guest speaker. 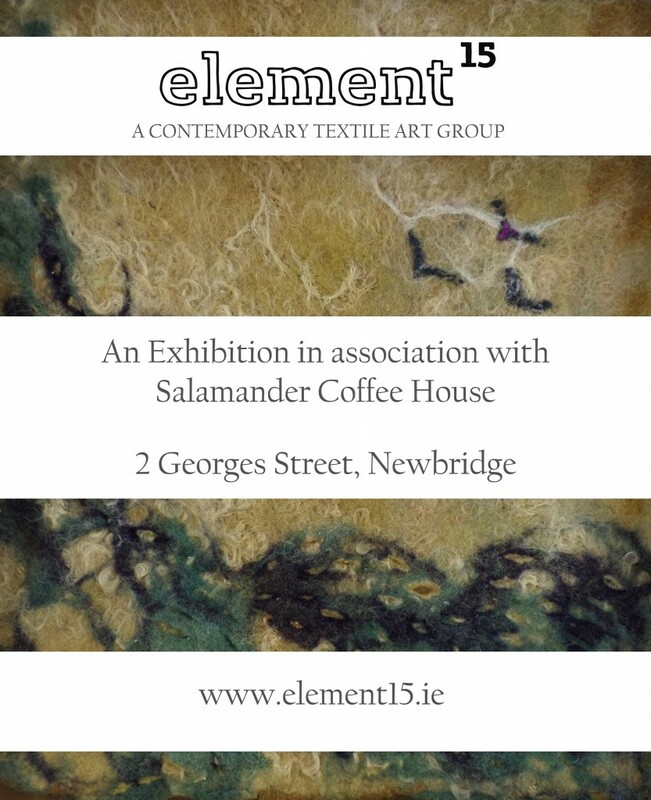 Preview Friday 19th June at 6 p.m. All welcome. 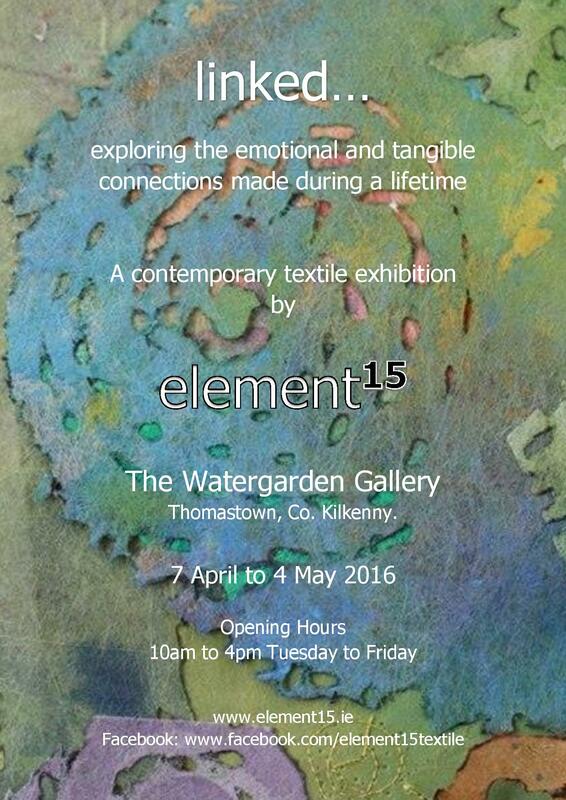 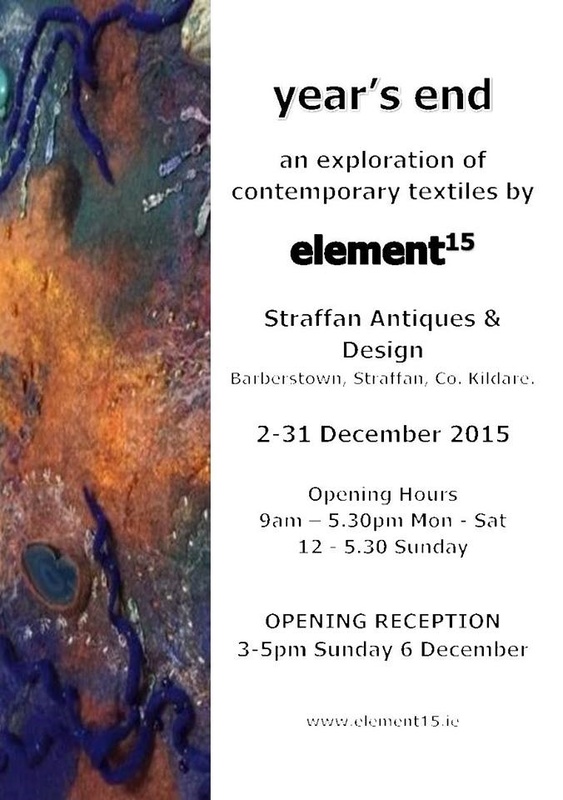 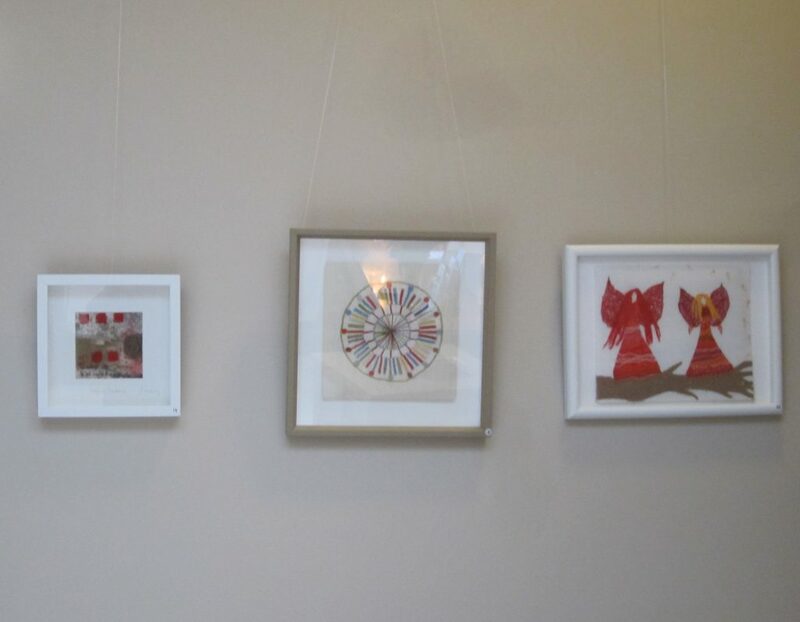 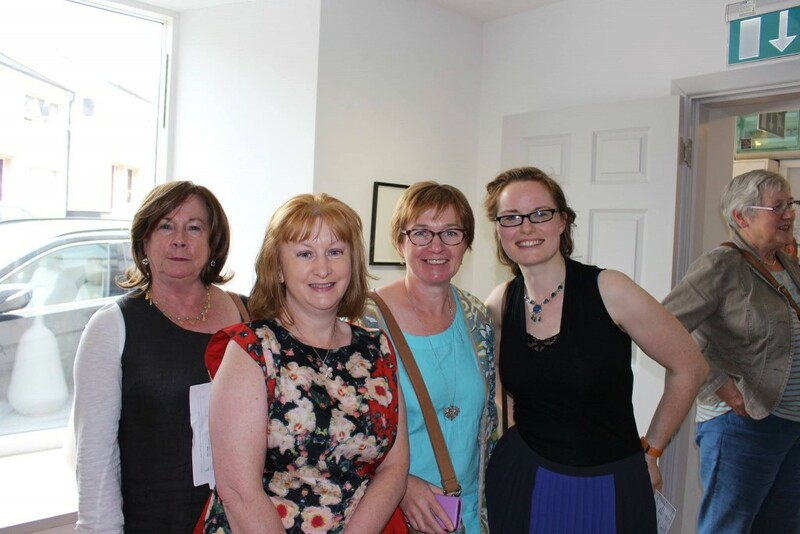 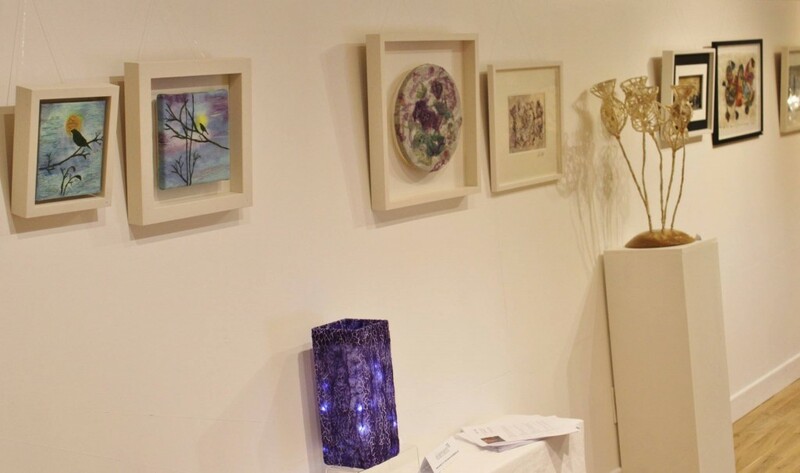 We were delighted to be invited to exhibit at the beautiful modern library in Ballyroan from 2nd – 15th June 2015. 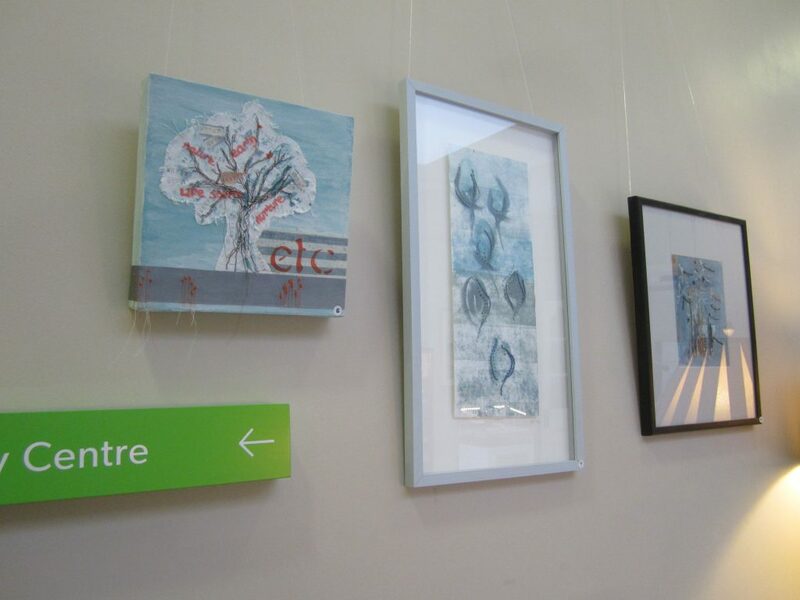 The library has a wonderful, purpose built exhibition space with good natural light and great exhibition lighting. 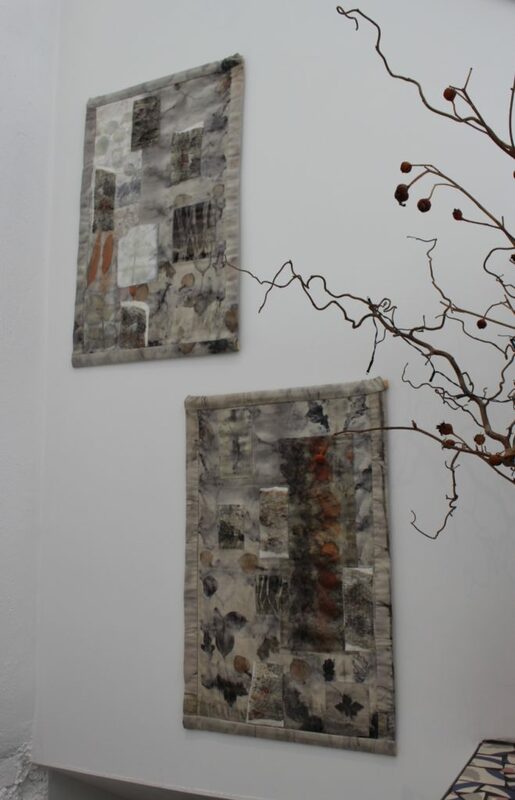 This is a very flexible space with unusual wooden panels that can be swiveled and adjusted to allow one to hang on one or both sides. 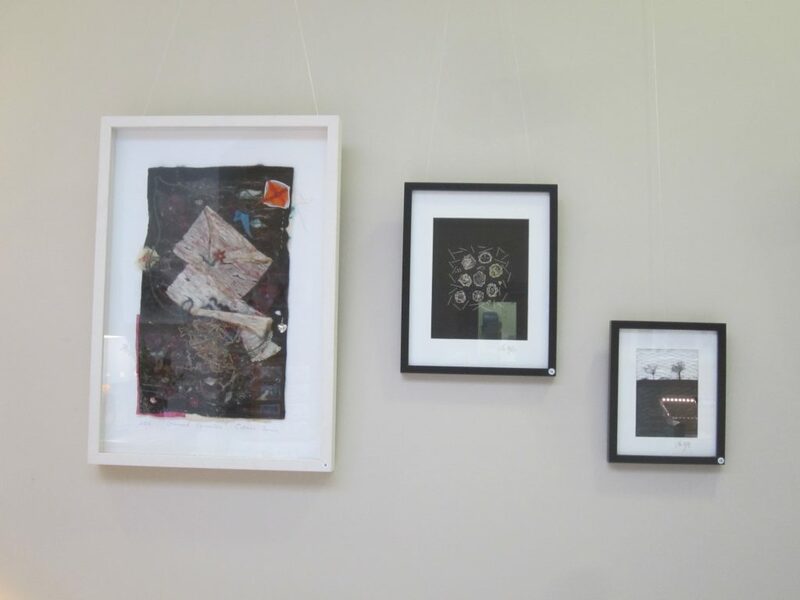 They also have really clever hanging mechanisms which makes putting up an exhibition a doddle! 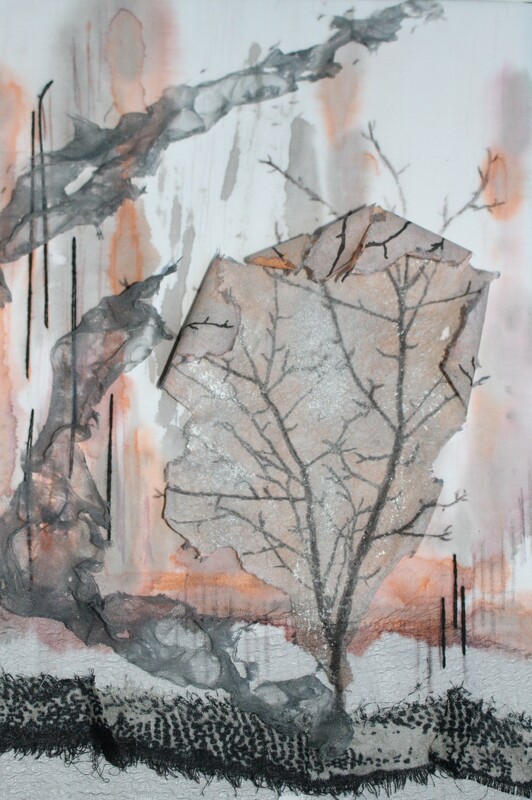 ‘Dance upon the Mountain like a flame’ by Vanessa Scott Hayward inspired by the lines of a WB Yeats play ‘The Land of Hearts Desire’. 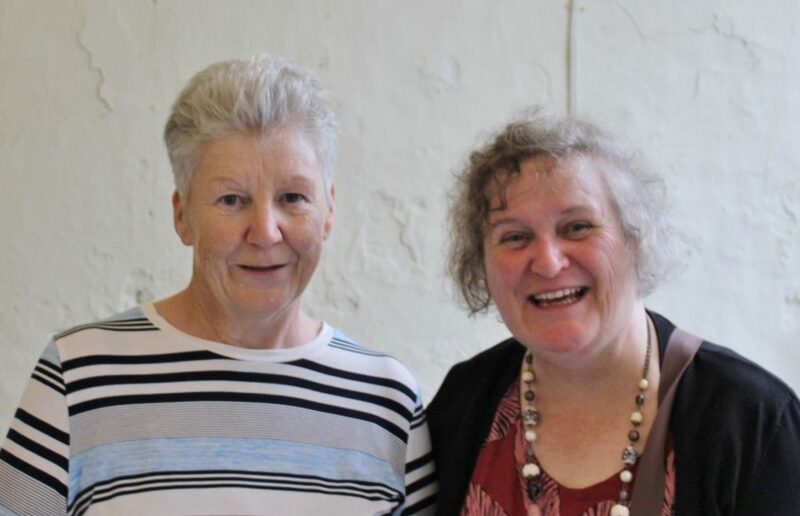 We are very grateful to the staff at the library for their assistance and support. 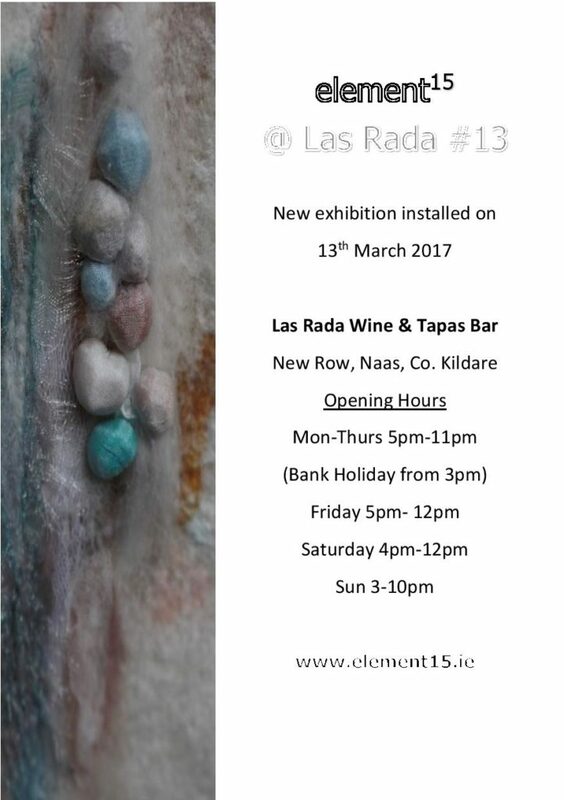 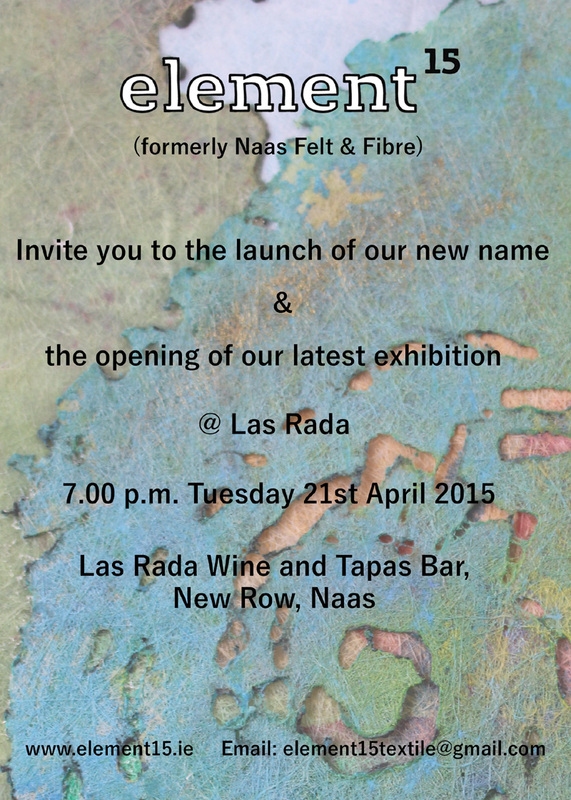 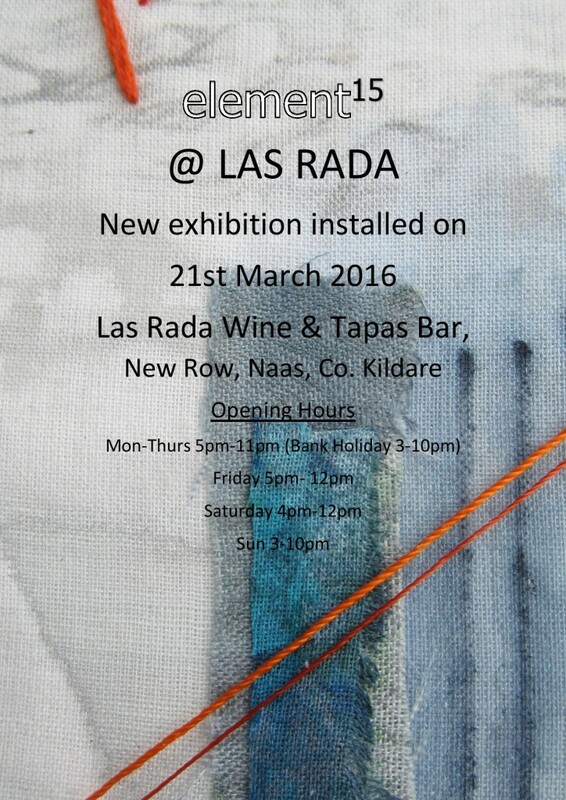 Launching Tuesday 21st April, our brand new series of work at Las Rada Wine and Tapas Bar, Naas. 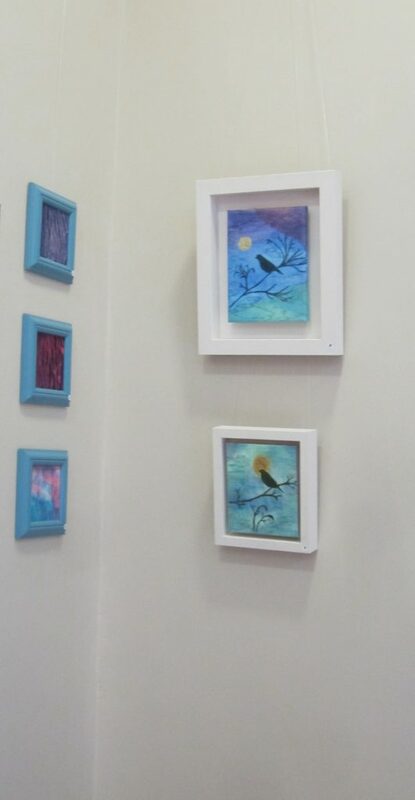 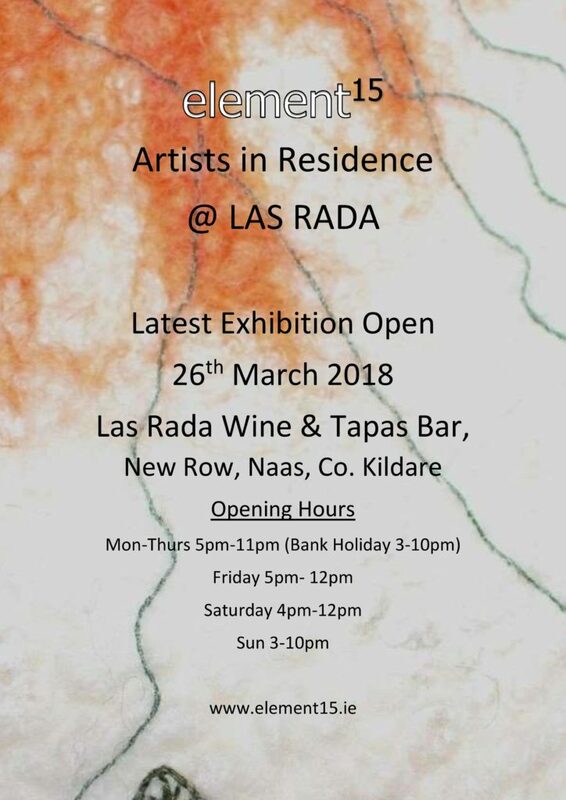 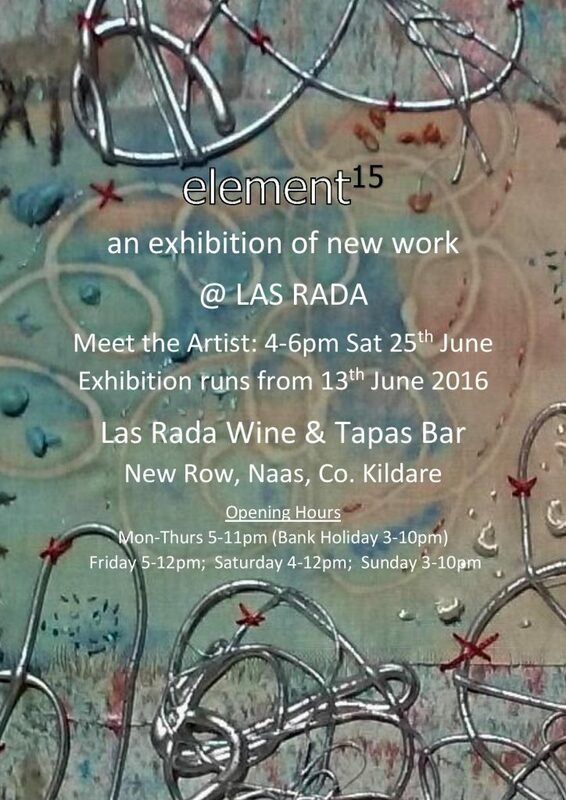 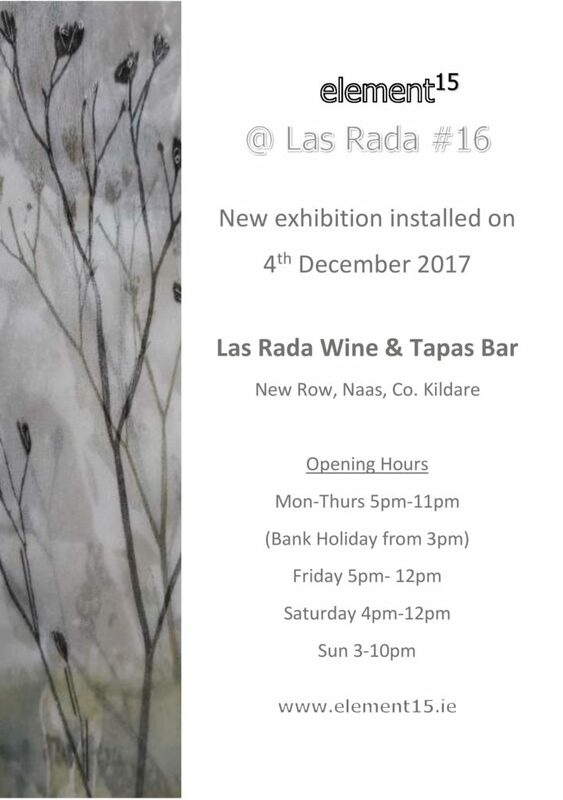 We are the resident artists at Las Rada Wine and Tapas Bar, Naas. 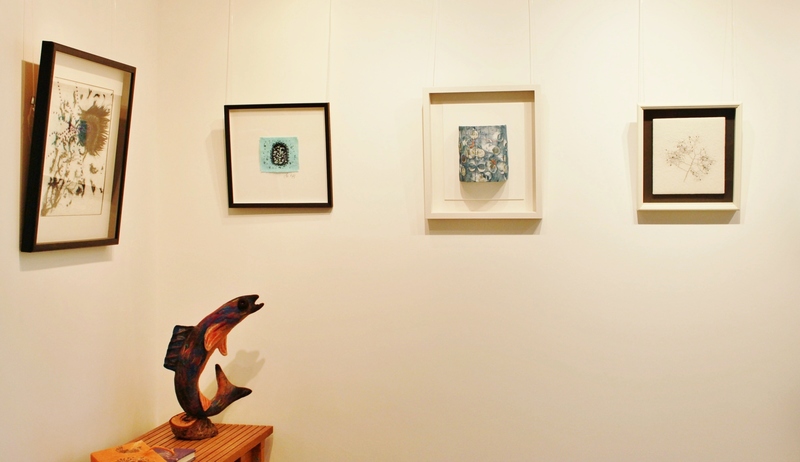 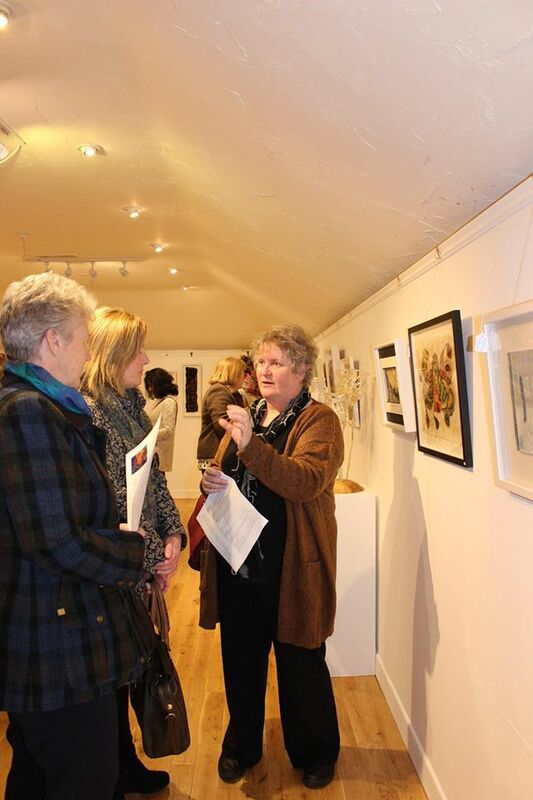 Our third exhibition there began on Monday 9th February, 2015. 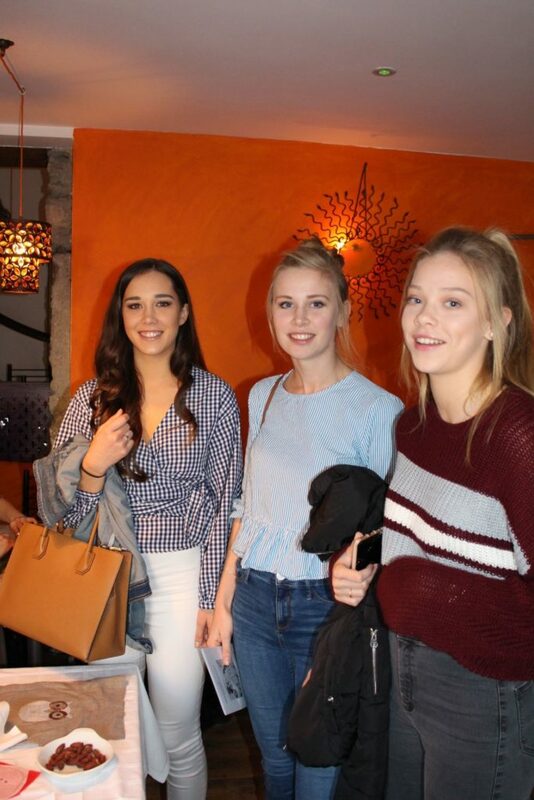 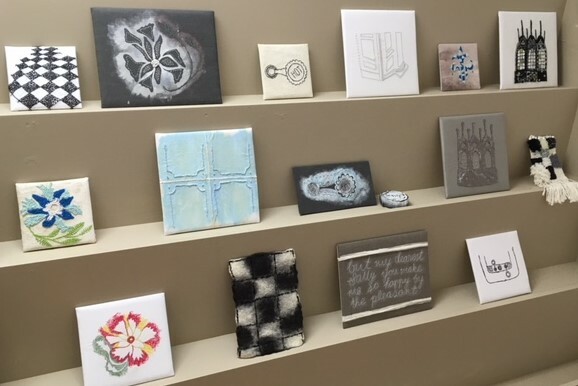 We are really liking this collection of pieces and how they fit in with the vibe in the Tapas Bar. 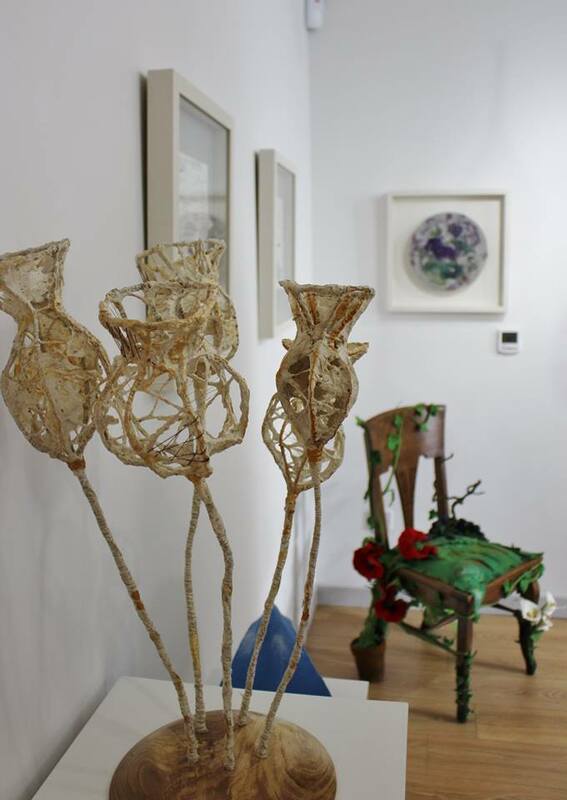 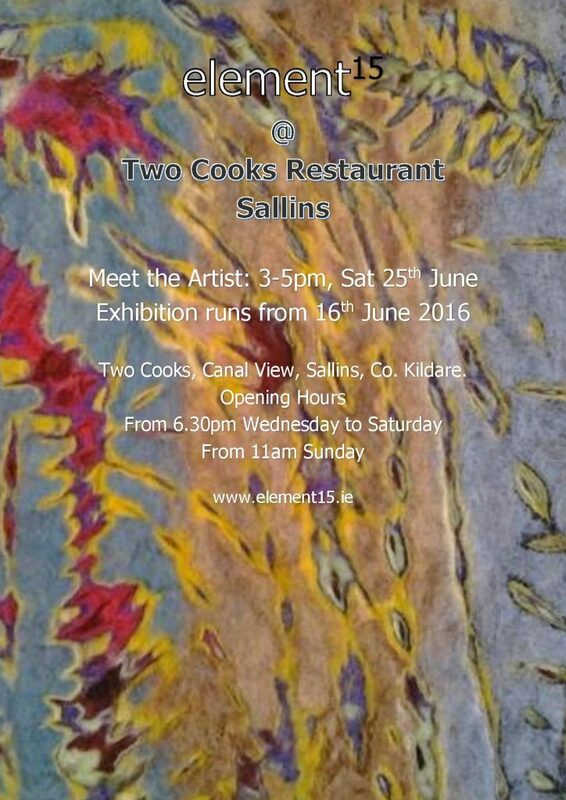 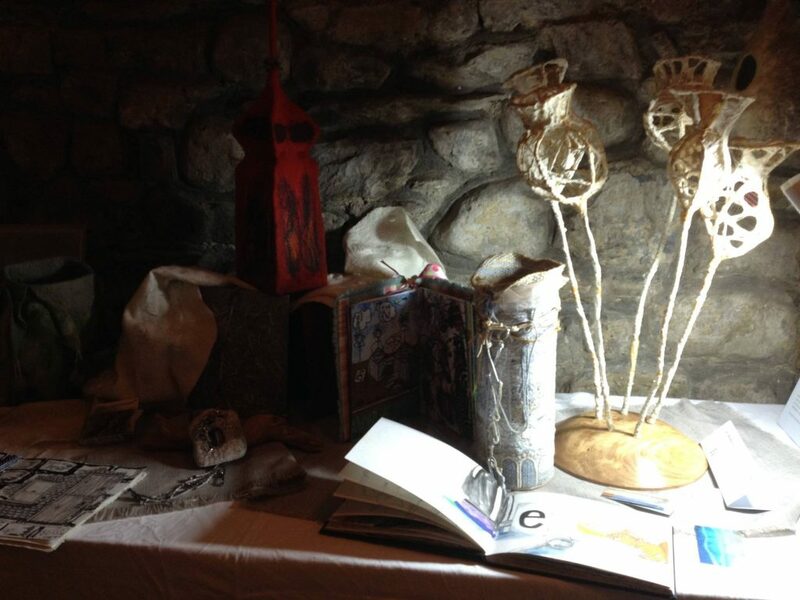 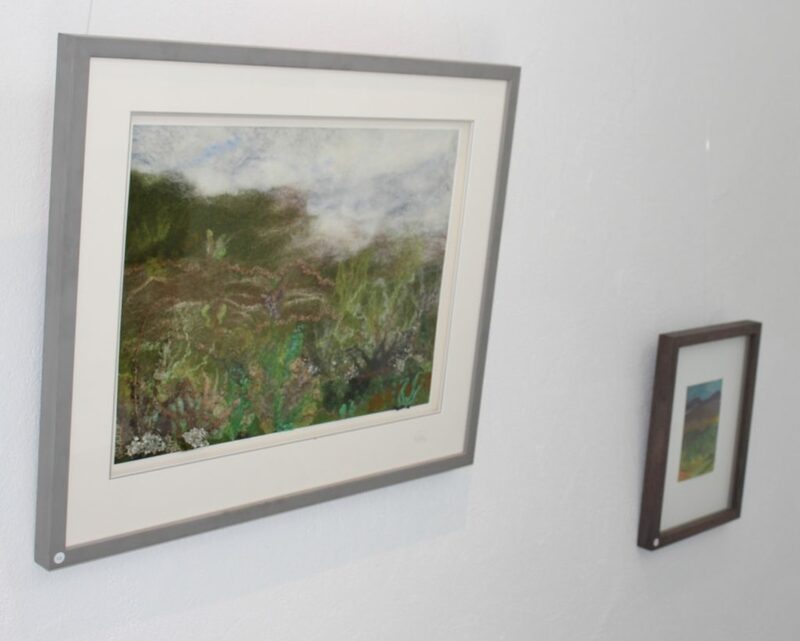 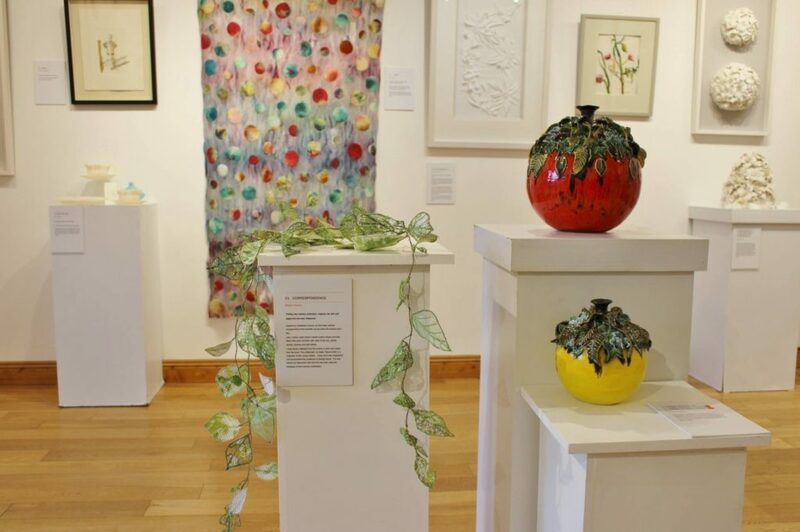 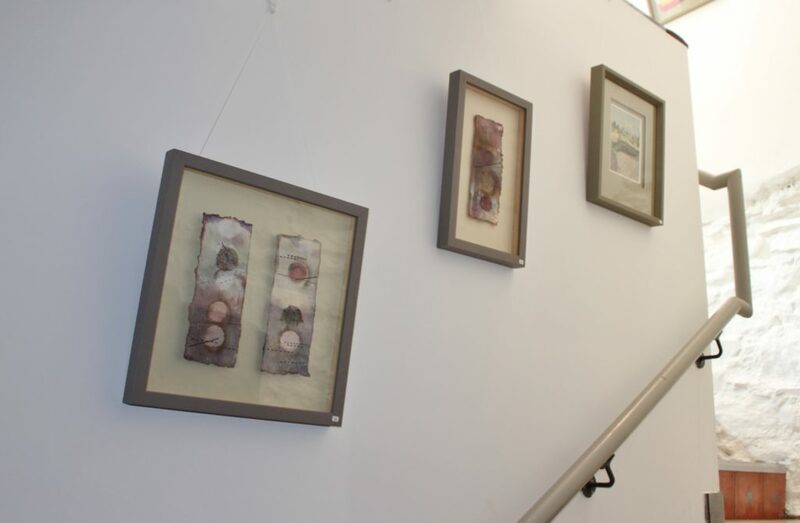 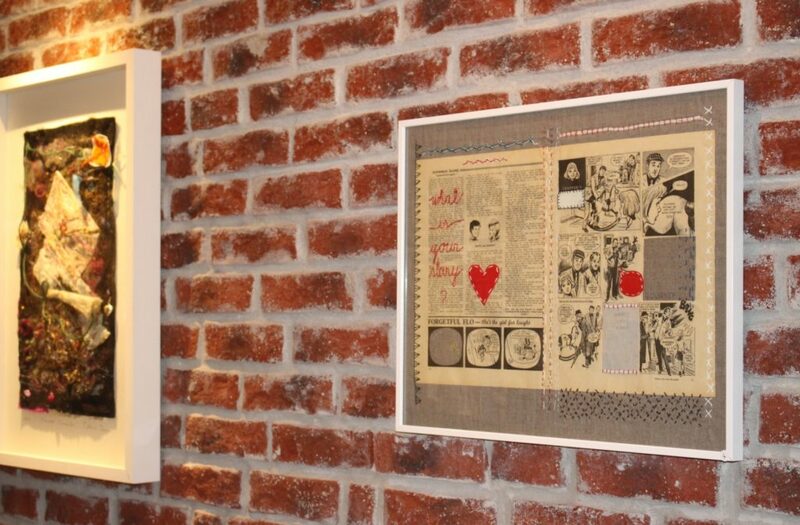 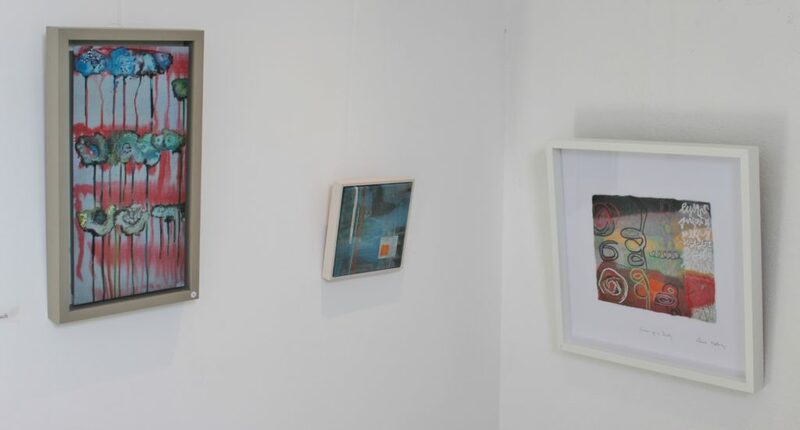 In June 2014 we were delighted to be chosen as one of the arts groups showcasing our work at Eigse Carlow Visual Arts Festival. 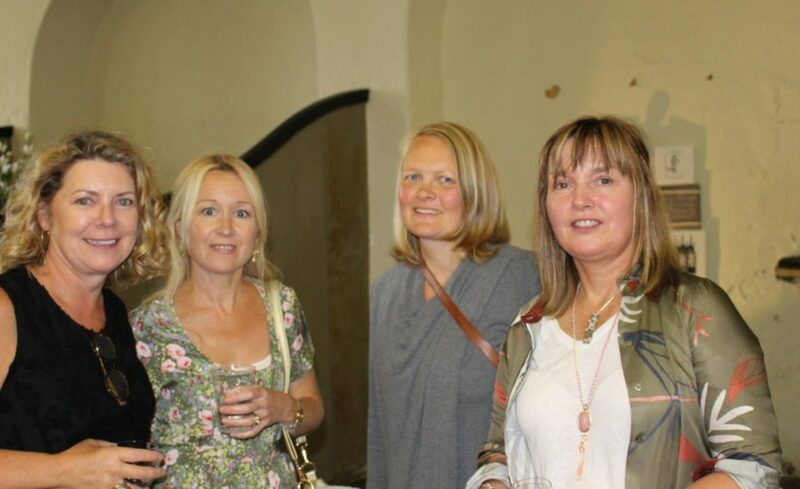 It was a fantastic success and a big thank you to all who organised such a great event. 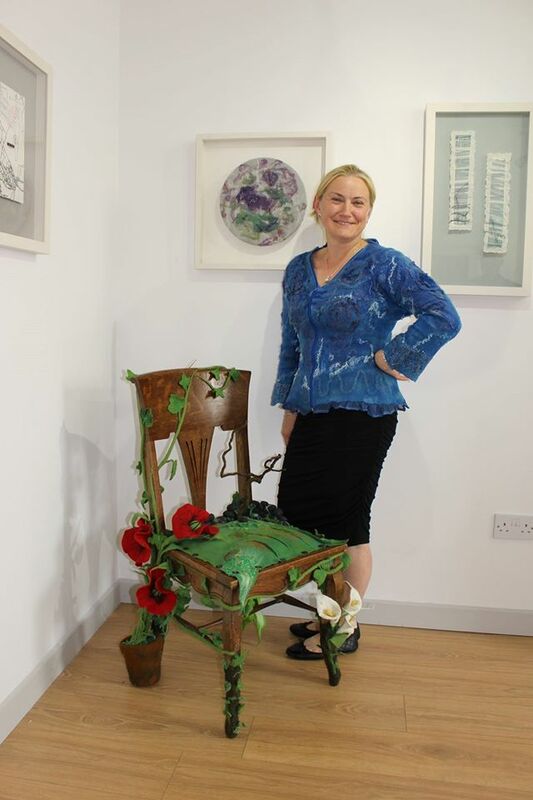 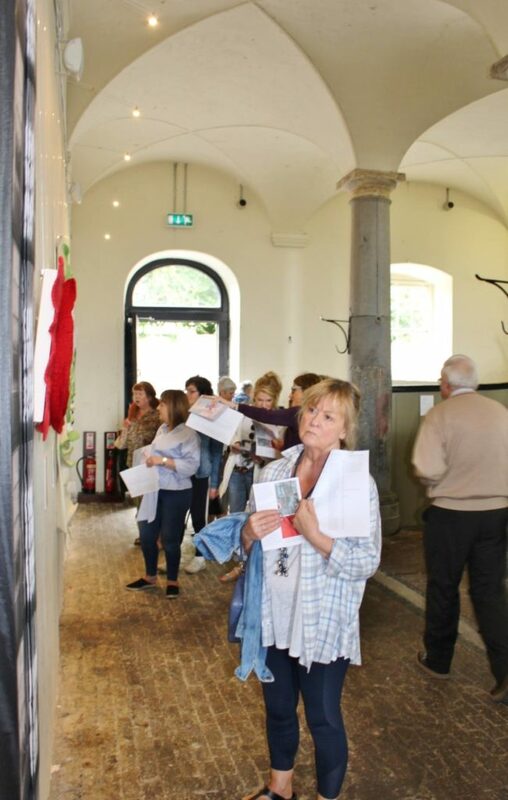 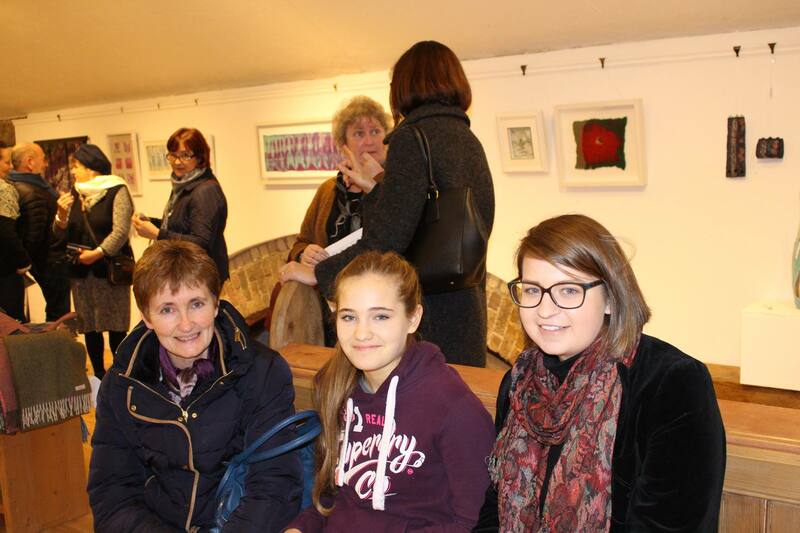 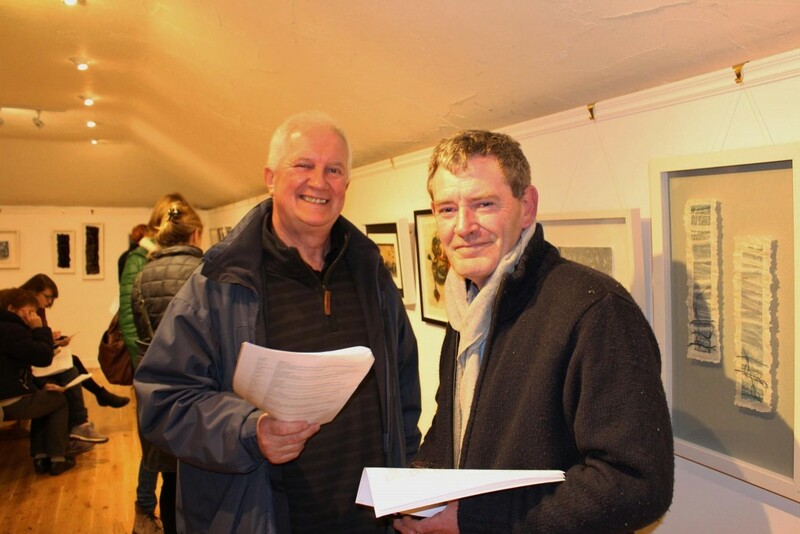 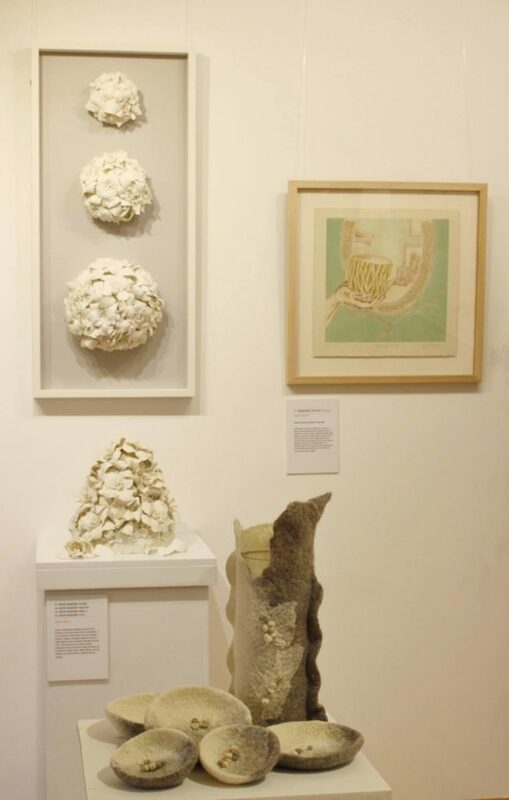 Visitors travelled from near and far to see the works of both local and international artists. 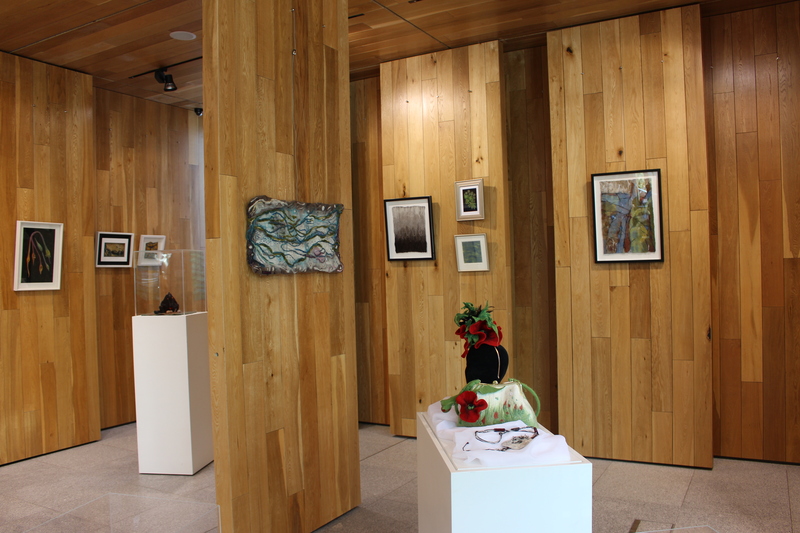 Highly recommended is a visit to the Visual Arts Centre there. 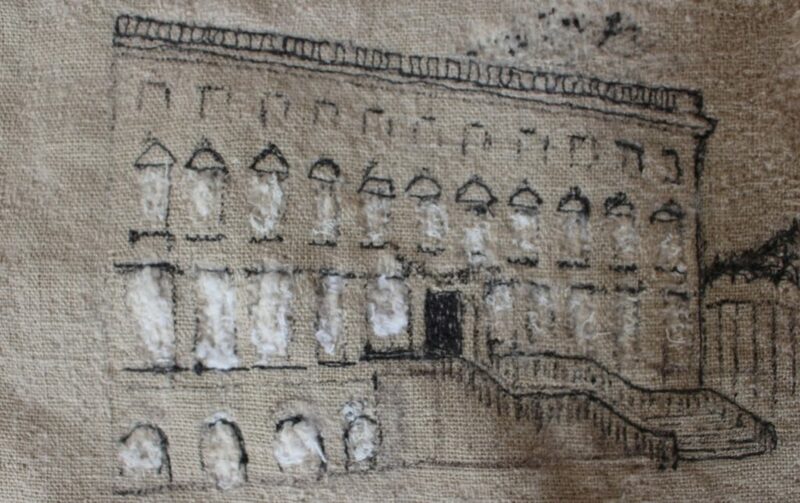 A beautiful building with a very tasty coffee shop! 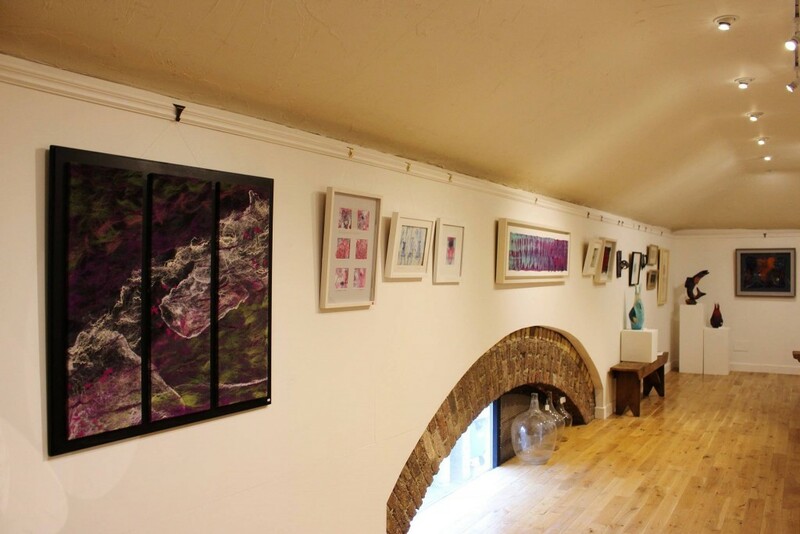 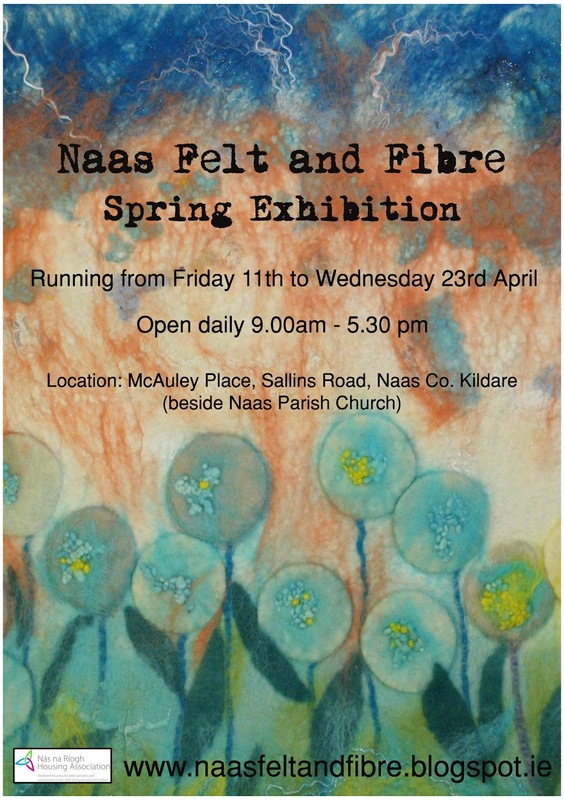 The space we exhibited in was once an old sweet shop and right on the main street in Carlow town. 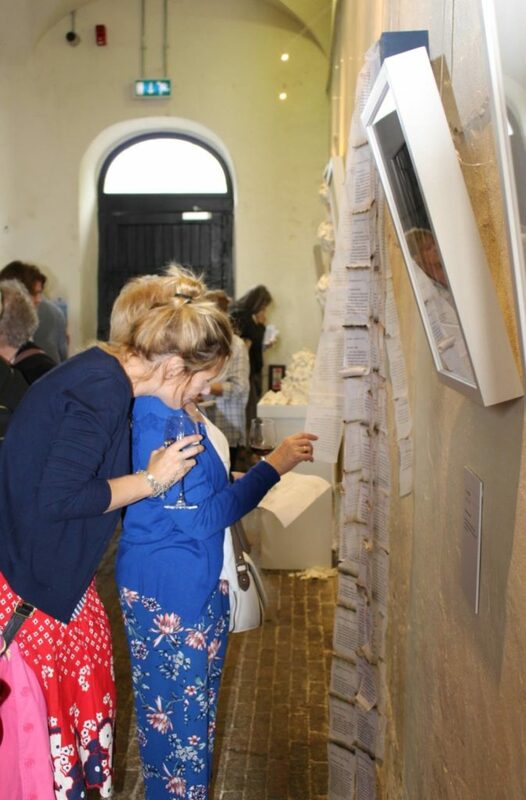 The exhibition ran for nearly two weeks and reading over all the comments from the visitors who came to see it the feedback was amazing.